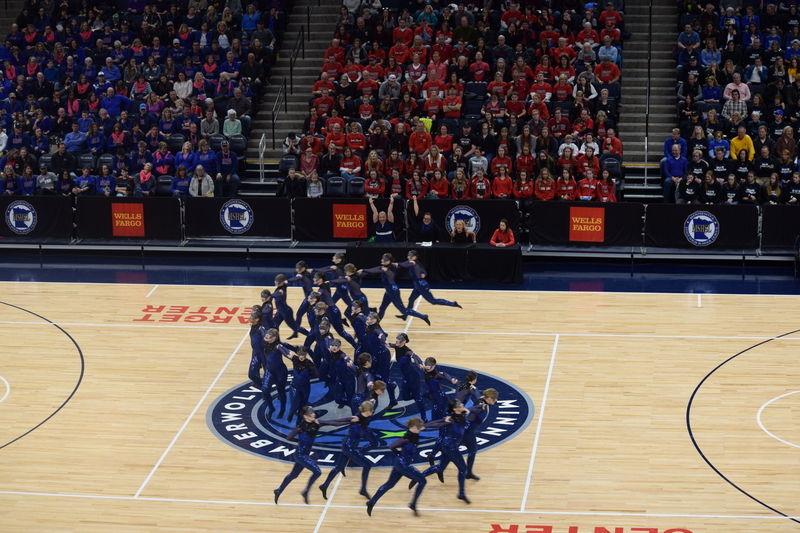 Stay Tuned for liveblog coverage updates from the State Dance Team Tournament 2018 – Kick Day! This page will self-refresh and display updates from our state coverage team, Erin Kruesi, Madi Salisbury, and Karen Steiner. Coverage starts around 11:15am. There will be a delay now of several minutes while the scores are tabulated. Bringing us into Studio 54 for the last dance of 2019, Lakeville North is fired up! 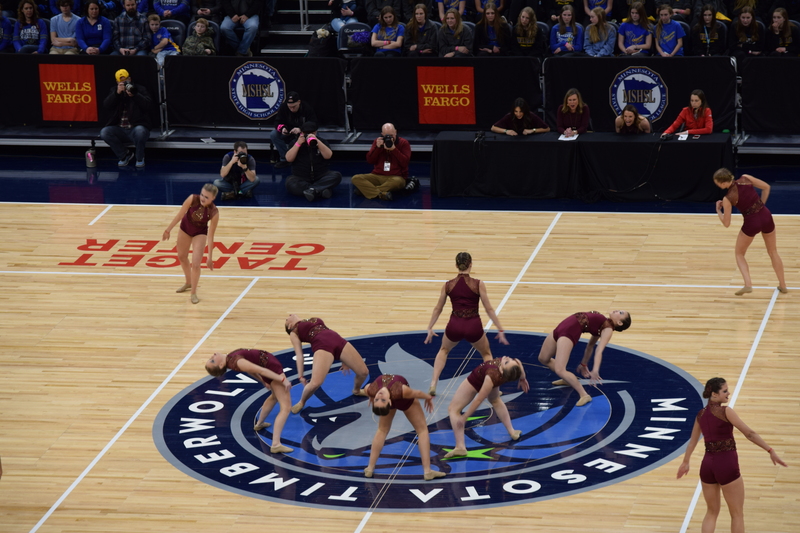 The skill and style of this routine is difficult in and of itself, and Lakeville is making those sky high jumps and flawless kicks look easy. You can see why this team is the section 1AAA champion! Great details, intricate formations have me wanting more and more. Lots of great kick combinations, unique hookups make this stand out as a top routine of 2019. Our “channel surfers” are back! Orono is closing out AA with their spirited, fun tv themed routine. The choreography creativity and content is practical, smart, and theme appropriate. The transition from black and white TV to color television during the Carousel of Color theme is a great detail! An audience favorite this year for sure, the entire audience clapping along to the Friends theme! Well done, Orono, this is a rewatch for me once I get my state “tapes”! Chaska’s Minnesota themed dance is just as great with the second viewing today! A dance that can take me on a tour through my home’s history? And show me some pretty amazing kicks at the same time? Sign me up! Some of my favorite noticeables were a snowflake formation, an homage to Target, the old Mall of America jingle, the state lottery loon, and the pride that the kids have dancing to this! Genuine spirit, snappy kicks, and show that this well organized routine was just as competitive as it is to watch! Love it, Chaska! Benilde-St. Margaret’s has me ready to stamp my passport with their adorable “Around the World” theme! I really like the creativity in choreography when they bring us to Italy, complete with spinning “waiters”. 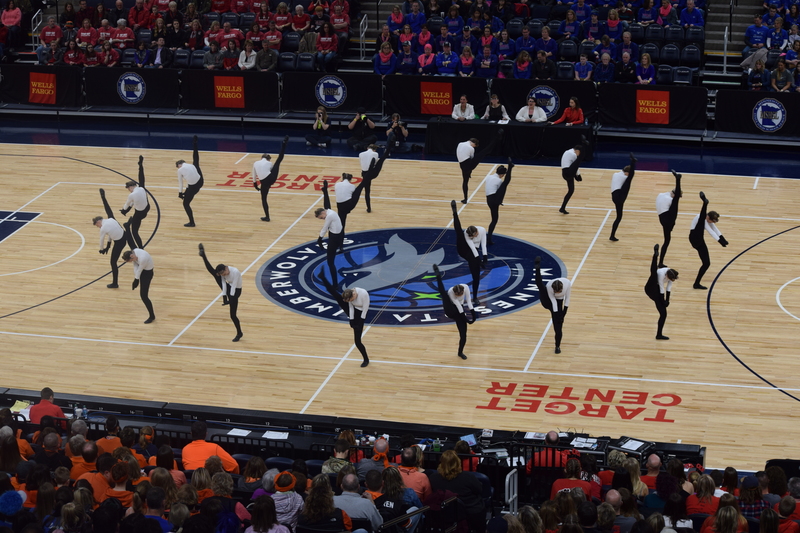 Well executed and showcasing a different style of dance, Paris is a fun highlight of this routine! An enjoyable world tour, ending with U, S, A formations, Benilde did a nice job with a spunky dance. Maple Grove is back to show us how tough they are in finals with their tribal “Survivor” theme. It’s a different style for Maple Grove and one that is working well for them. 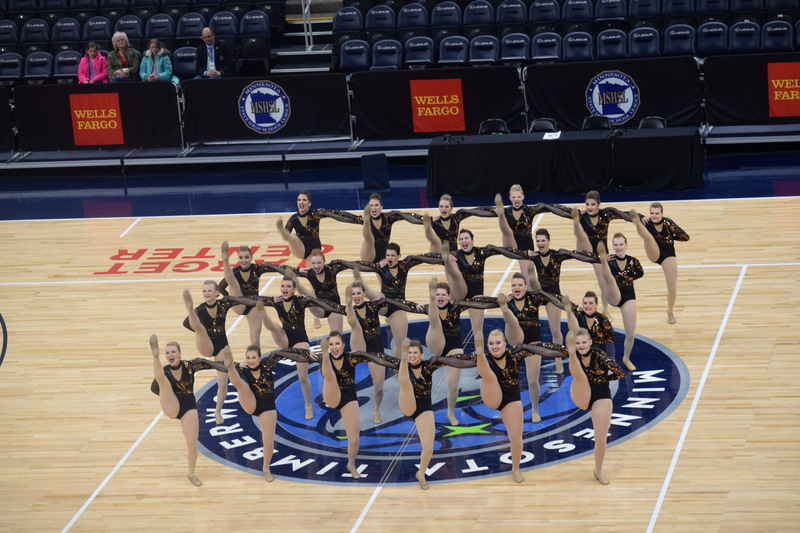 Kick timing and height are some strengths of a team that is full of talented dancers. It’s a nonstop routine that has a lot of unique properties to it. One of my favorites from the Crimson! 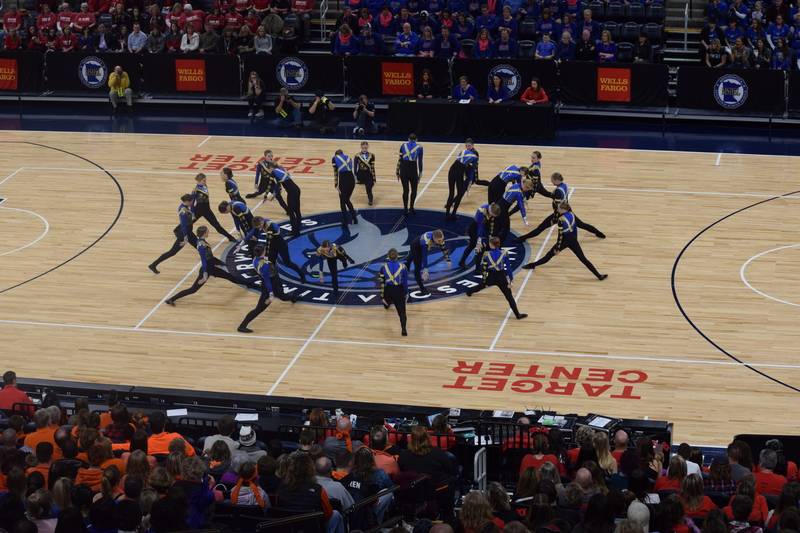 Sartell is back to defend their 2018 title with their powerful Pharoah routine! The stylized moves make this uniquely theirs. The energy and talent on the floor is really shining as turns are hit, kicks are high, and jumps are flying. I love all the showcase moments that really drive this fun Egyptian theme home. 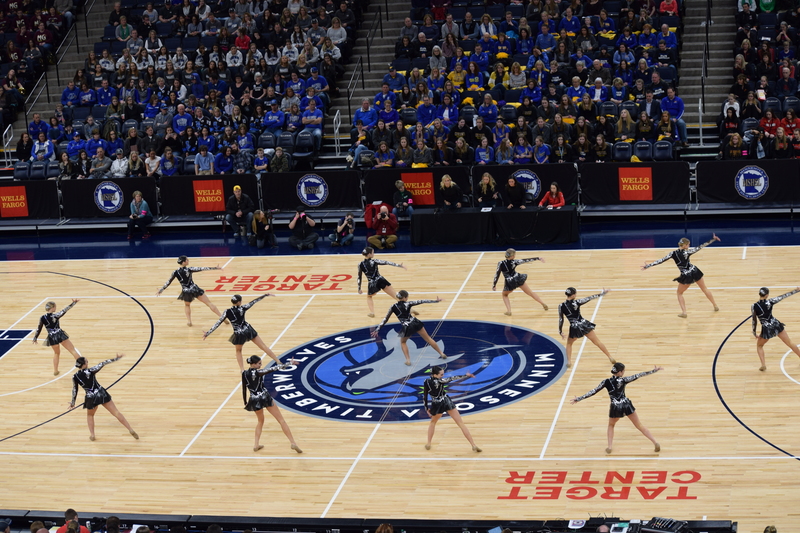 Eastview is back with hopes of defending their 2018 title with a smart routine. The intricate formations, layers of choreography, and kicks that go to another level make this another top routine from this perennial powerhouse. The talent that this program has been able to showcase year after year is impressive and I can’t wait to see this one again. Well done, Eastview! Dust off those air guitars, Faribault is back with their fun Rock of Ages routine! What is impressive is the consistency and accuracy in the kicks from the Emeralds. Height, placement, footwork – it almost feels like one athlete is cloned! What an engaging routine with lots of moments for us 80’s kids! Faribault should be proud! Brainerd is back with their Aladdin dance, which is well received by the crowd. It’s well thought out with highly stylized moves, great transitions and formations which showcase the 4 different colored costumes. This is harder than it looks to choreograph and Brainerd makes it look easy. Their kick technique speaks for itself, with extension being a strength of Brainerd. A state showing to be happy with, for sure. Austin comes out with their “Cover Girl” dance, showing us those beautiful, high kicks that they debuted in prelims. Lots of cute choreography. Don’t be fooled, this atypical Austin style is difficult and it’s showing very well on the state floor. Well done, Austin! 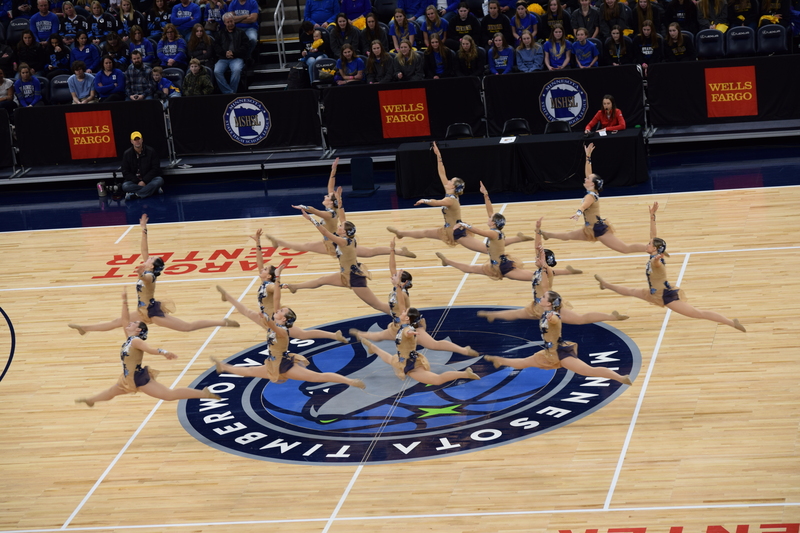 The Wayzata Dance Team makes a commanding presence with their incredible choreography decisions. 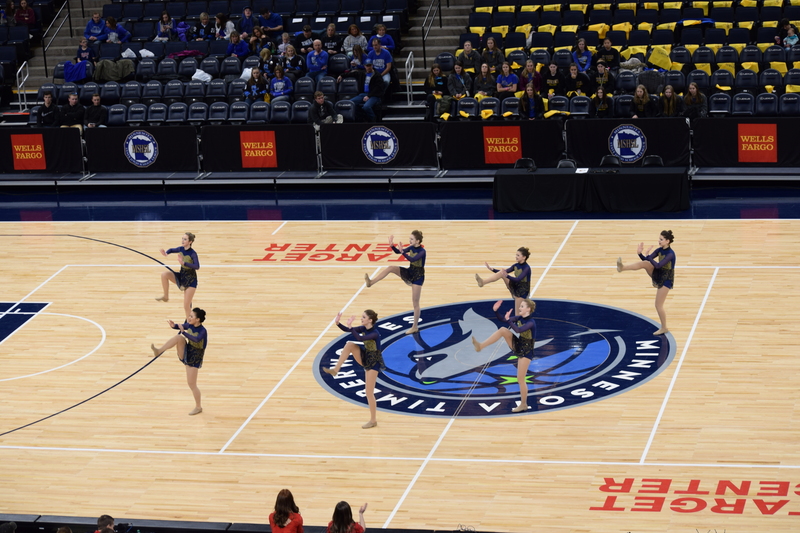 The athletes on this team make it look easy, which is the ultimate compliment in dance team. Kick height, technique, and timing is some of the best I’ve sen. Sparkly moments left and right due to the high level of content in this routine. This should be a proud moment for Coach Swiggum, ending on a high note. 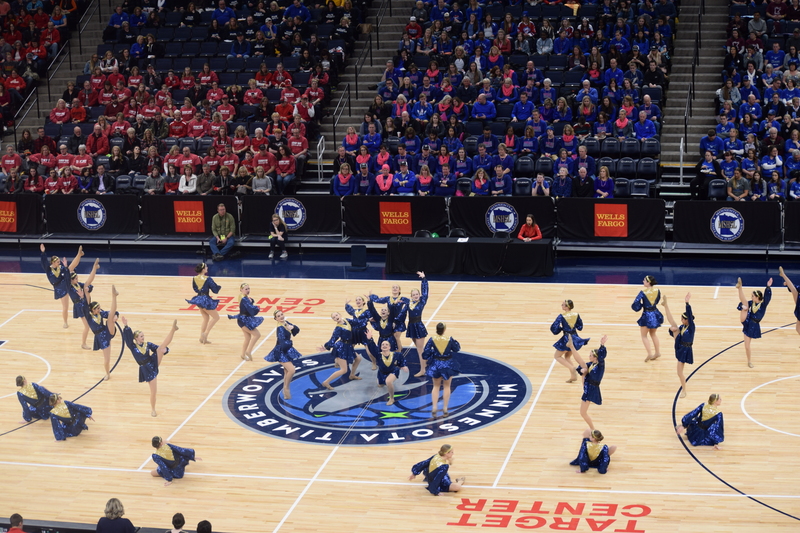 The Totino Grace E’Gals kick off finals in a BIG way with their Thieves IN the Temple routine. So many cool moments that work great wiht this song choice, including sneaking a look under a gorgeous hooked back leg extension. Totino’s layered choregraphy, highlighting flexibility and skills make this routine fun and unexpected. A performance that they should be pleased with to end their 2019 run! We’re getting close, grab your final refreshments and bathroom breaks! The Target Center is getting antsy, with The Wave making it’s way around the arena. Lac qui Parle Valley wins a double blue this year, first year winning any division and they win both. Quite an accomplishment for the Shadows. Yellow Medicine East finished us out in finals with a very strong Survivor performance. Their moving fan sequence into a reverse zipper is memorable and effective. Subtle details like 2 arrows splitting apart show up on a second watching. Class A finals sure surpassed expectations this year! Lac Qui Parle Valley hits all the right notes with a great blend of difficulty, clean, fun, polish, and the whole package. They started kicking and it really feels like they’re in another league. Beautiful final dance of the year from LqPV. Bagley is the definition of creativity this year with a great twist on “vikings”. AAA fans who missed prelims sitting behind the performance freaked out watching the transition from viking warriors to viking football players. Gets em every time! Aitkin starts with some real finals power. They have a unique alternating fans sequence that stands out above the crowd. They also choose some hitching arm moves I haven’t seen before and keep things spiced up. Great work from the pros. Lake City’s workin it tonight in finals with a routine that was even more fun to watch the second time around. I saw more sparkly and themed moments on the second viewing that made this both charming, and full of details. Kick height went up this go around as well. Great finals push from our workout crew. 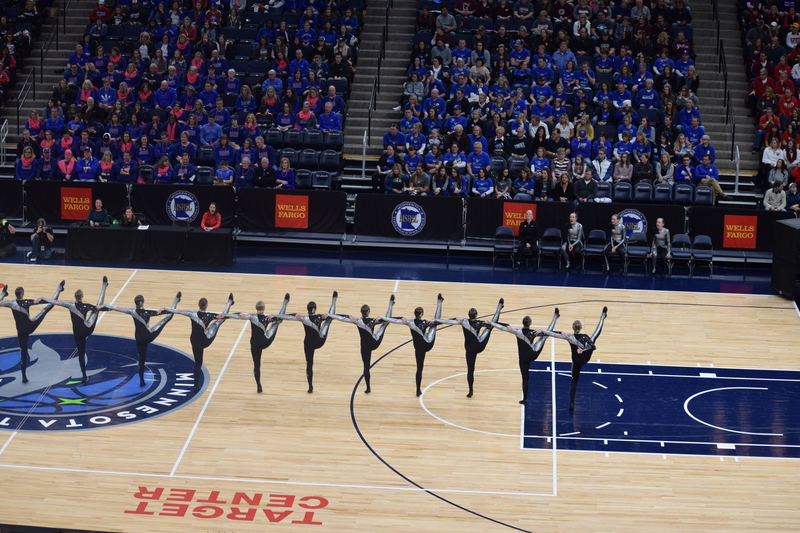 Class A kick finals — We’re underway with Frazee starting us out with a dramatic and powerful routine. intensity and power went up tonight as Frazee hopes to defend their title. an 8 person maintenance crew has to follow up their makeup use, so we’ll see if thats considered a delay of meet. Time for a short break. We’ll see you back at 5:25PM for the National Anthem and Class A Finals! AAA Fans, welcome your Qualifying Teams back to the floor! Finalist announcements in a few minutes! AA Teams are coming back to the floor! There we have it, dance team fans! I’m sad to say that 2019 Prelims are officially over. 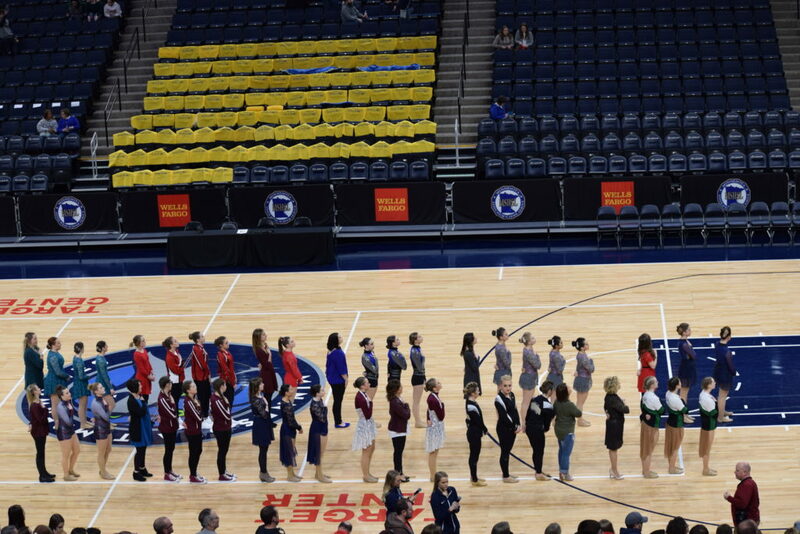 With only 18 dances left of the State Tournament, we are awaiting the announcement of the AA/AAA finalists. Announcements are slated to begin with AA at 4:15, so take a little break and write down your predictions for the finalist teams. I already have mine done! And, with the final 2019 AAA Prelims performance, Henry Sibley High School takes the floor. Some nice solo kicks and a team toe touch start off this routine. 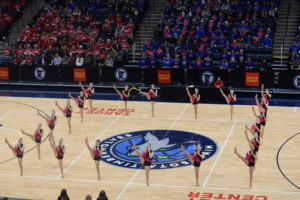 Sibley is historically bringing a stylized theme to state and this year is no different, as they are doing a tribute dance. A lovely color change in the middle of the routine to take them from all black to a lovely red and gold is very effective. 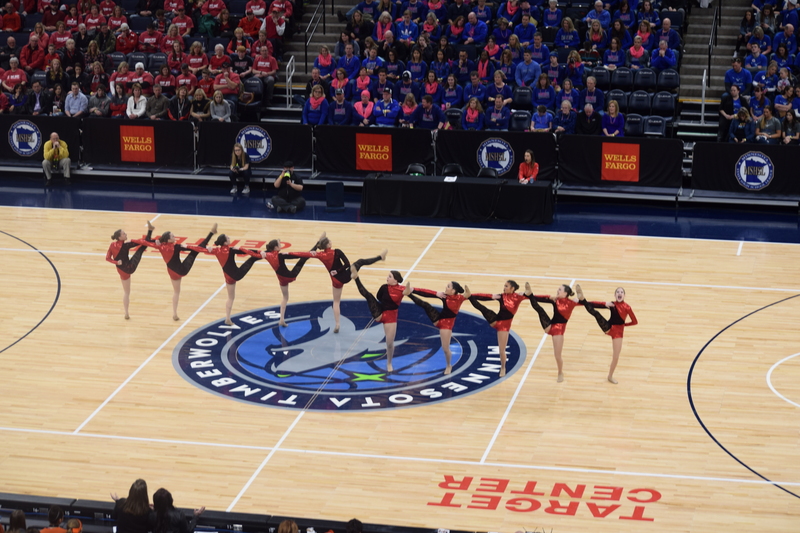 A nice, clean dance from Henry Sibley! Closing out AA Prelims is St. Cloud Cathedral. A fun “Monopoly” theme, complete with little top hats and tuxedos, shows nicely on the state floor. They’re taking us on a tour of all of the icons in the board game Monopoly, including riding the train and dancing to the jail house rock. Love the creativity! St. Cloud Cathedral is showing us a lot of great variation in kicks and formations as they’re moving nonstop to this routine hitting long straight line to Under the Boardwalk. A cute, high energy routine to close AA prelims to, nice job CHS! 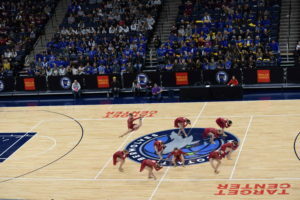 Maple Grove shows us how they’re not giving up in their “Survivor” routine. The beautiful skill that we’ve come to know and love from Maple Grove is apparent in this routine that’s slightly out of the box for them. it is more fluid and less structured than what we’ve seen in the past and it’s nice to see them take it to a different level. Some super cool moments and unique choreography from the Crimson make this a very pleasing routine, and definitely one on my re-watch list from 2019. Wow, Faribault! I’m surprised those opening toe touches have even landed yet! 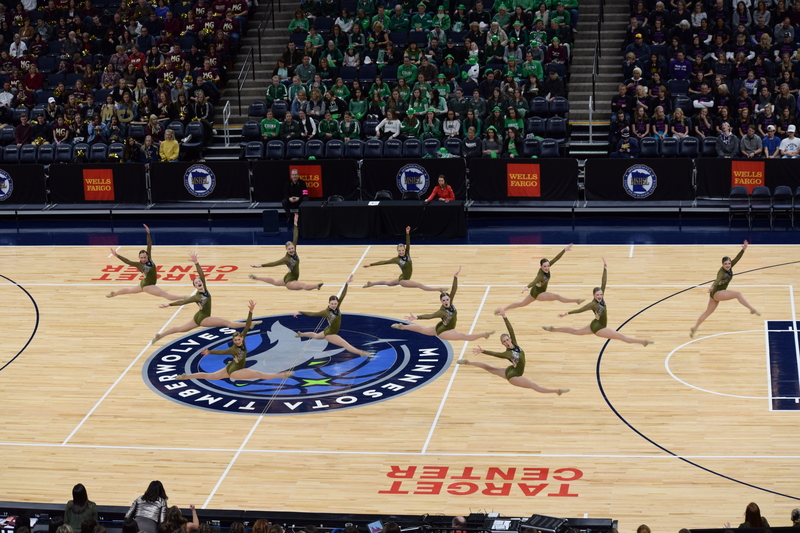 A delightful “Rock of Ages” routine, Faribault brings their usual creativity to the floor with some really great kick sets and full body choreography. Fun music that touches all of us 80’s babies in the Target Center, it was nice to see them taking control of that routine and owning all of the stylized pieces in it. Spring Lake Park really kept the “party” going with a high energy routine. They had some great consistency throughout that routine with kick height, execution, and accuracy. 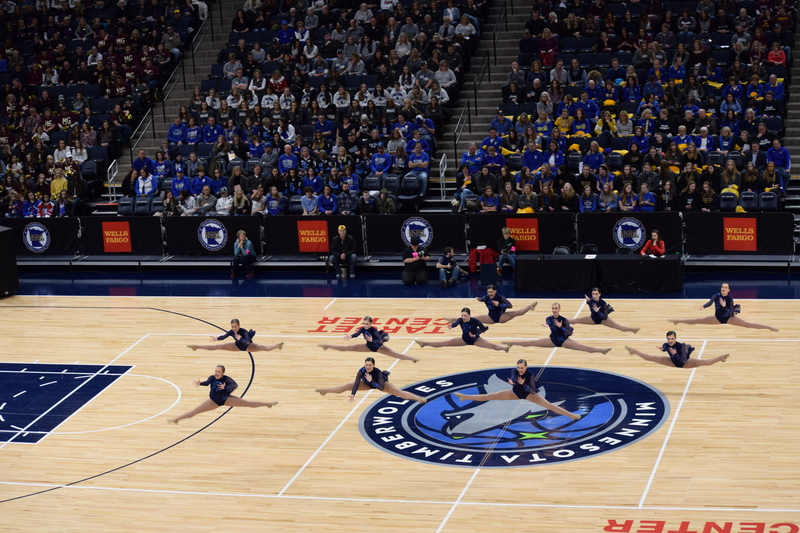 Always a fun team to watch, the SLP Dance Team really owned their routine! Fresh off of their AA Jazz win last night, the Totino Grace E’Gals are making a strong showing with their “Thieves In The Temple” routine. Layered choreography is a specialty of Totino and this routine is no different. It is creative, intricate, enjoyable. A smart costume choice, their kicks are showing just as well, some of the best that this team has had in recent years – and that’s saying something! One of the most traditionally strong programs in Minnesota, Totino shows us that they are out for a finals spot! 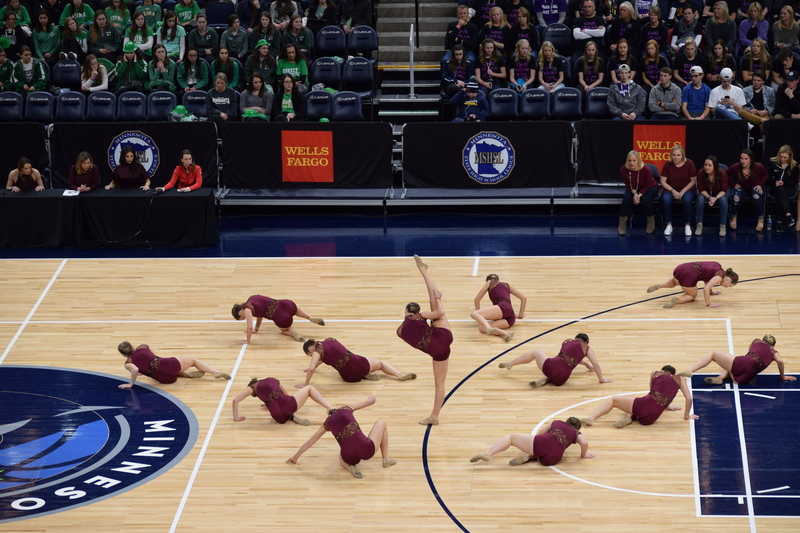 Anoka brings us on a journey this year with their “Uncharted” routine. Very themed, creative, and intricate, this team has focused on kick technique and it shows. 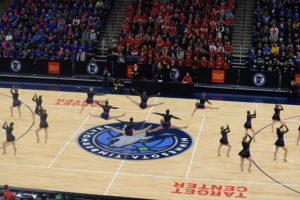 Overall, this routine is the best I’ve seen out of Anoka. 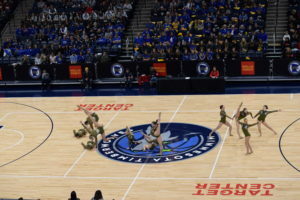 Every corner of the floor utilized, kick difficulty showing nicely, along with some very unique choreography. Smart choices overall by this team, making a strong statement as to why they want to earn their way into finals again this year. Hutchinson brings a fun “fight” theme, complete with hooded boxing warmups and gloves. A high energy routine, complete with jabs and bells brings this theme full circle. There’s even a great transition that looks like they are skipping rope in training! During their “final countdown”, the team brought some kick difficulty in at the end to keep it evenly paced. Fun routine, Hutchinson! Prior Lake with a fun radio theme, dancing to top hits, sliced in with real radio bits. Plenty of content, high kicks, and a nice confidence make this one not only fun to watch – but easy to sing to! 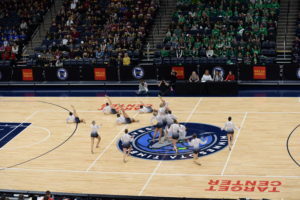 Well thought out choreography is showing well for the Prior Lake Dance Team. They’re really making a splash this year with the crowd and showing how talented these athletes are. The Orono Spartans take us through the history of television with some great theme songs. An interesting costume choice, the Spartans wear grey/black/white costumes for the portion of their theme songs that took place before color TV, with a great color change to full color once the shows hit color film! Wonderful creativity, formations that really follow the song choices (a ship during Gilligan’s island? I saw you!). I really enjoyed this one, and so did the crowd! After getting a taste of finals in Jazz last night, Orono is fighting hard for a top 6 placement! Sauk Rapids-Rice starts off with some great visuals that really are pleasing to the eye. 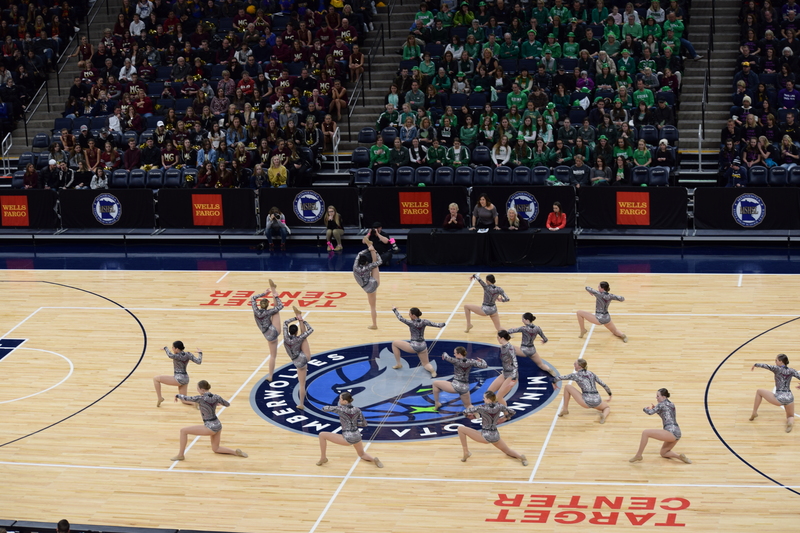 There’s a nice variety of moves, levels, and floor use in this routine from Sauk Rapids-Rice. They have some well executed traveling kicks. Overall, a nice routine! Austin’s adorable “Cover Girl” theme really works for them. Lots of great moves and a genuine sense of enjoyment, the athletes are enjoying this one as much as the crowd! Kick difficulty is a strength on this team, it’s fun to see them really nailing a routine that is difficult and high energy. Well done, Austin! The defending State Champs, Eastview, once again shows us why they are a top team in the state. Their formations and transitions are always top notch and this year is no different. They are constantly moving and showing how talented these kids are. 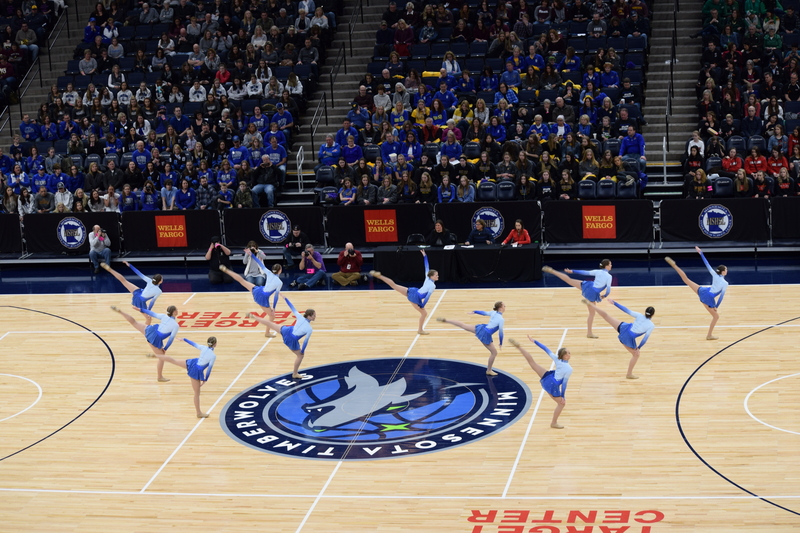 Tons of content, difficult skills, incredible kicks, and energy that blows the roof off of the Target Center make this dance unforgettable. A perennial State Tournament Team, the Marshall Tiger Dance Team brings us their version of “Survivor”. 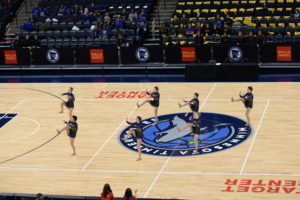 Lots of sharp choreography and interesting kick sets are a big strength for this team. A nice, clean routine by Marshall! 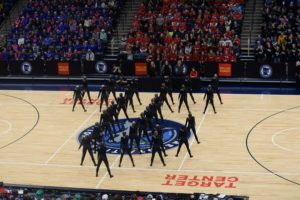 Right off the bat, Centennial hits a beautiful long line that showcased some great kick choices. 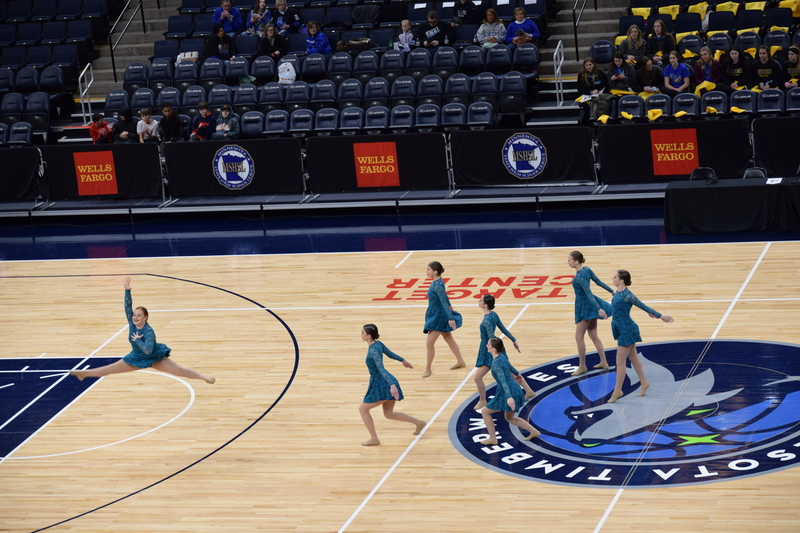 Formations and transitions have increased in creativity for this team over the years and it’s been really fun to see their improvement on the state floor! The striped pants are a unique choice, but work really well for this team. Well executed and overall a nice routine that is full of some great visuals, the Centennial team really showed well on the floor today. The defending state kick champs, Sartell are back for more in this great Egyptian pharoh themed routine. Lots of stylized moves, combined with the Sabre’s always spot on height make this a great dance to watch. Difficulty is off the charts, with lots of “wow” moments, full body movements, jumps that fly, and genuine excitement. 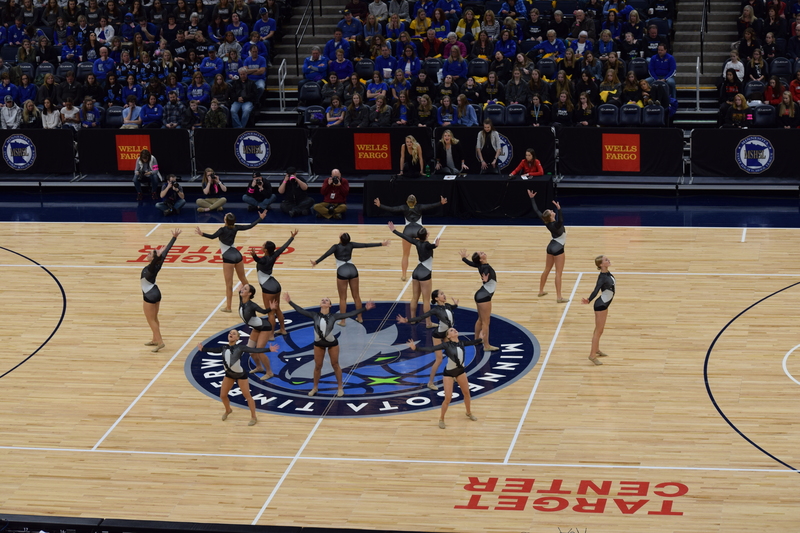 Another great routine from Sartell! 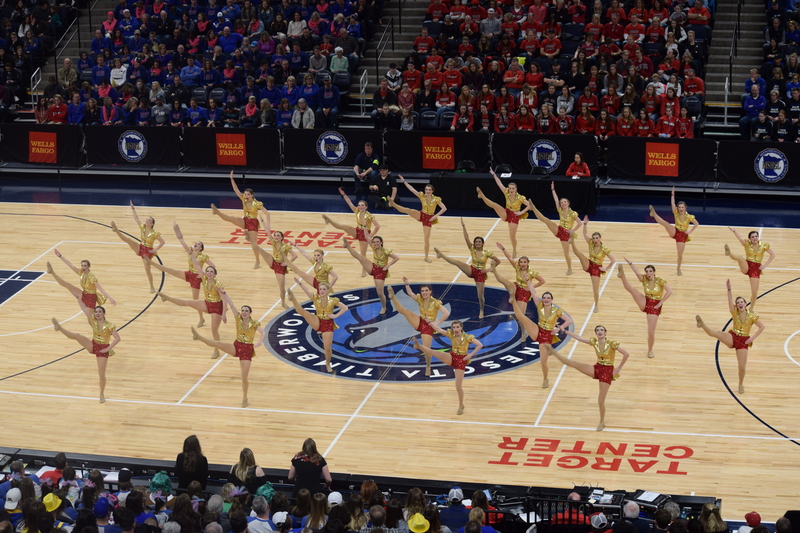 Lakeville North starts off strong with their 70’s themed “Studio 54” dance, shows us why they emerged as the section 1AAA Champions this year. Very clean, full of content, and technically sound, this classic disco remix doesn’t take itself too seriously with some solid Saturday Night Fever moves, but don’t be fooled. Lakeville North is working hard to stake claim on a finals spot for this evening. Chisago Lakes, with a creative Fire & Ice routine, uses two different colored costumes to create a visually pleasing routine. 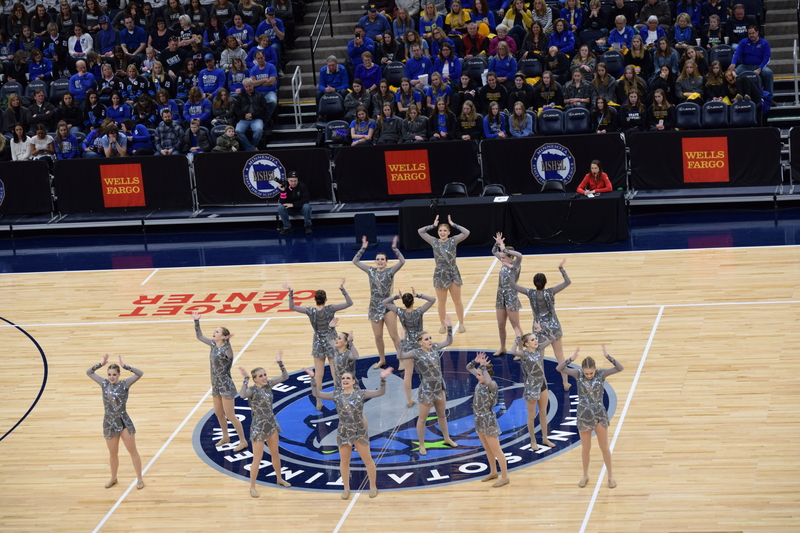 A well thought out routine, the Lakettes used their costumes to the fullest. Nice job, Chisago! 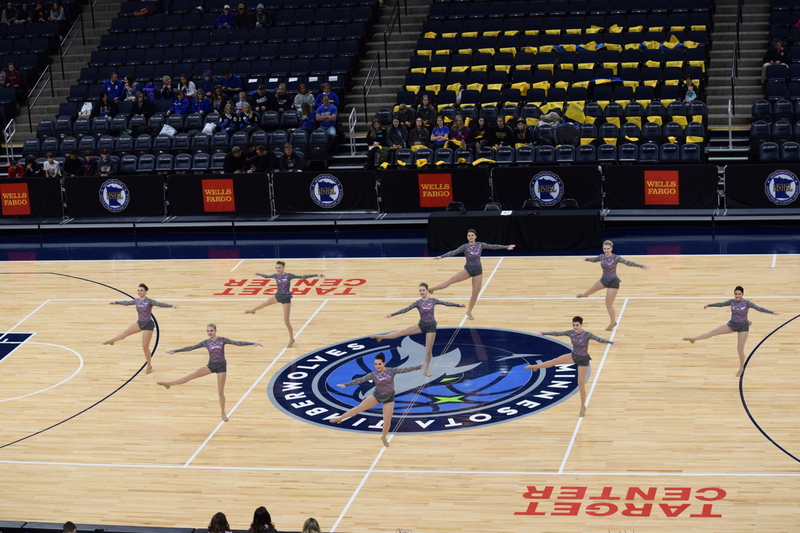 Fresh off of their AAA Jazz Crown last night, Wayzata is taking the floor with the confidence of a team that is comfortable on this stage. 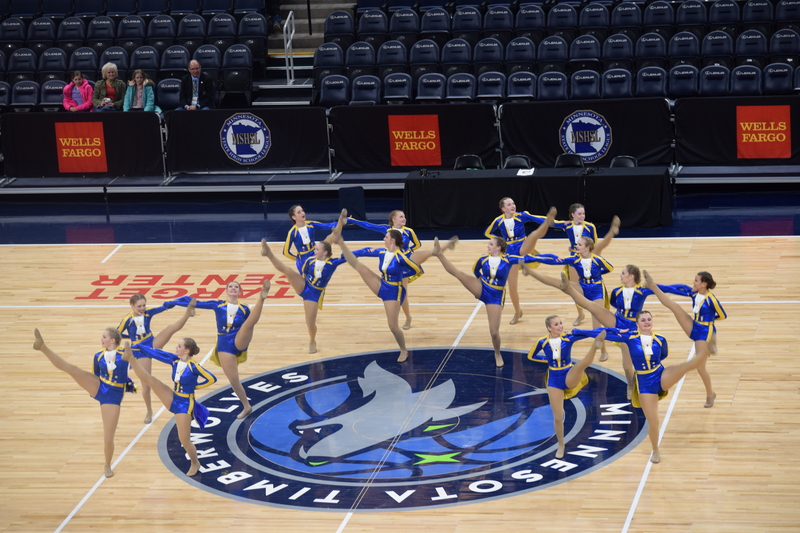 Doing a fresh twist on “Vogue”, Wayzata’s highly trained athletes are taking this dance team favorite to a new level. Intricate, formations that are just working, and incredible execution, this is an instant classic. It’s great to see the athletes having so much genuine enjoyment out there. A great performance for 30+ year veteran Coach Leslie Swiggum’s final State Tournament. Taking us on a choreographed trip around the world, Benilde-St. Margaret’s immediately catches our attention with some highly skilled showcase work. It’s fun to see the creativity this year, making a “pizza” formation during an Italian portion of their song. 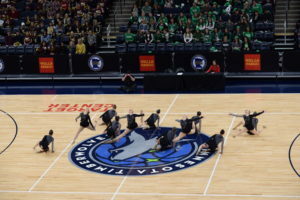 A high energy routine that doesn’t seem to stop moving, Benilde is showing the talent of their kids with various styles, showcases, and flattering kick choices. Brainerd used all their wishes on their creative Aladdin dance this year! A color costume dance, with 4 different genies out there, is very entertaining. 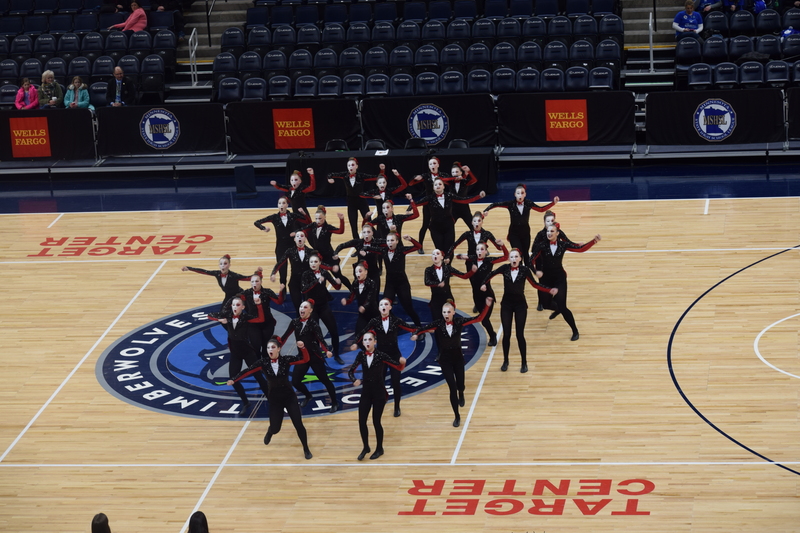 Brainerd has been doing well with this dance this year, and with an emphasis on content and creativity, they’re making a strong argument to make finals tonight! Rocori, decked out in sunshine yellow, is showing us how “happy” they are! This team has invested in kicks the last few years and it is paying off. Their height and technique have been improving year after year. A cute routine that centers around the word “happy” hits home with the audience, putting a smile on everyone’s face. Nice job, Rocori! 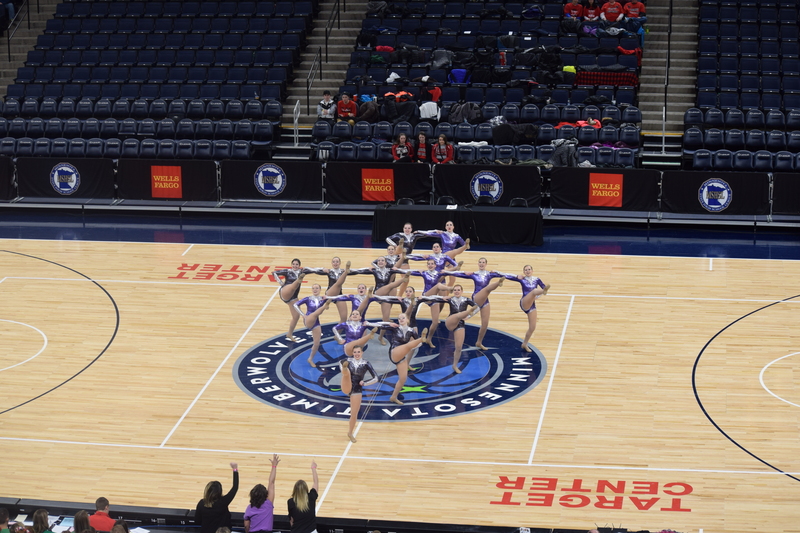 Chaska is our first AAA team to take the floor, and, boy, did they not disappoint! A fun Minnesota themed routine, complete with Skol and a visual “touchdown” pass. Love the surprise moose antlers in there! Really enjoyable and fun, working in all of what makes Minnesota uniquely ours! Pairing that theme with the kick height and technique that we’ve come to love from Chaska, this routine takes us on a fun ride and a great start for AAA! Here we go! Simley brings us back to the 90’s with some great sequined jackets in their routine featuring some Salt ‘n Pepa, MC Hammer, and other great tunes. Opening kicks are full of beautiful technique and height. Great use of the floor, touching every corner in this high energy routine. A different style than we’ve seen from Simley in the past, it’s great to see them pushing their skills! The ceremonial handshake is complete, the floor is clearing. We should be underway in just a few minutes, with Simley kicking off AA. Grab your seats, the AA and AAA coach and captain introductions are beginning! The Class A fans are clearing out after an exciting preliminary competition. As usual, the kick fans came out in full force, with attendance easily higher than yesterday’s jazz day. Judging by the number of butts in the seats, I’d say it has increased by about 30%. The AA and AAA fans are starting to filter into the seats. 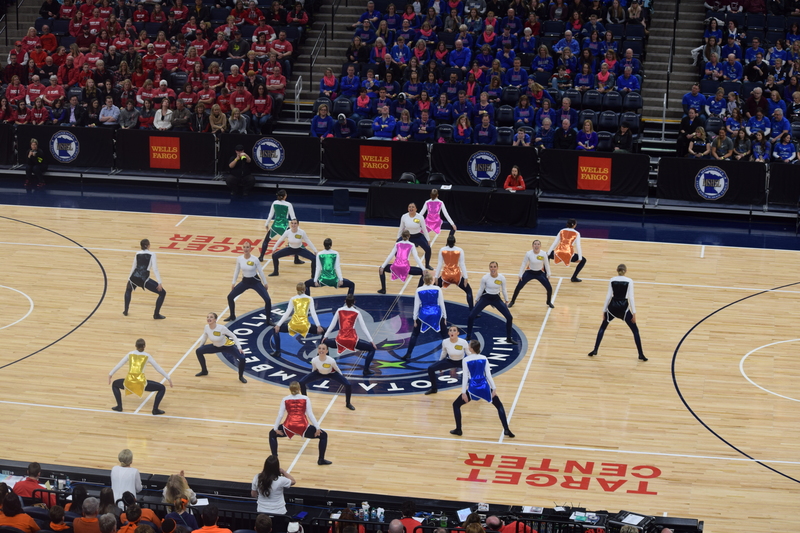 More school colors, crazy wigs, and themed outfits that match the routines that they’re cheering for are filling the Target Center. Refresh your snacks and beverages, we can’t wait for AA and AAA competition to begin! St. Charles takes us on a vacation, with a routine that was jam packed with action. Very sharp start and interesting kicking formations. The opening with double toe touches were very memorable and accented the music perfectly. PACT Charter returns to state in kick after 4 years with a Conspiracy theme. 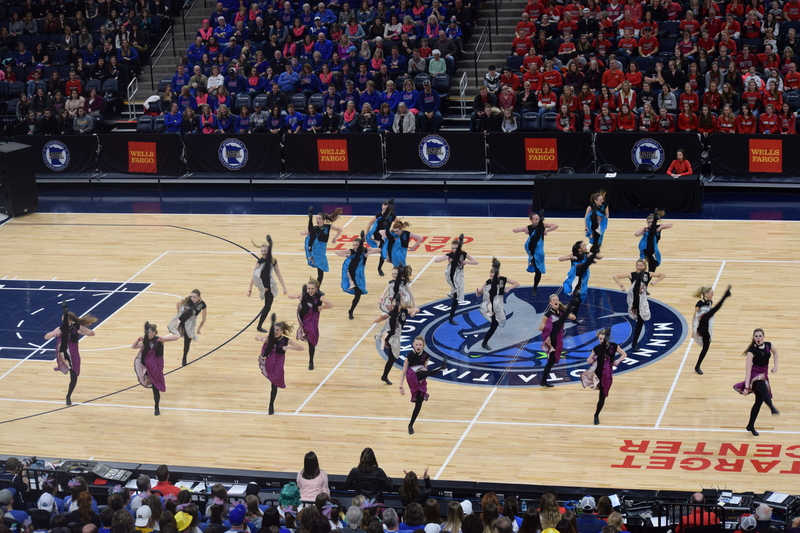 Always sharp and strong, the Pantherettes showed how they earned their way back to state with a clean and flattering dance. Great solo kick sequences were a highlight. Aitkin shows why they’re one of the strongest kick programs in A year after year with some of the most difficult kicks we’ve seen today. Formations were also some truly unique and creative 3 dimensional shapes we’ve had so far. Wabasha Kellogg takes us around the world with their flight themed routine. Routine impression and genuine expression were high marks for WK. Their difficulty and creative choices have taken a step forward this year as the program continues to make solid state appearance year after year. Lake City worked us out with their 80s’ throwback to the Jane Fonda era. The little “stretching” sequence at the end was a hit with me. Not taking itself too seriously, but very serious about their sharpness and technique — Lake City is looking good! Yellow Medicine East had some great choices for formations and transitions, complimented by difficult quality of movement that stood out from the division. More complex dance steps that were still clean made this routine sophisticated and daring. Strong start to the day for YME. Lac Qui Parle says Don’t Stop Me with their Queen mix. Great technique, exceptionally clean, and exciting visuals put them well into finals contention today. After last night’s jazz win, this one will be in the hunt again tonight! Bagley has one of the most fun dances ever with a surprise change from “vikings” to “Vikings”. the costume transition was top notch and the theme movements and formations were well planned. To top it off, the technique, execution, cleaning, and energy were all above the mark. Should be a great contender today. Atwater Cosmos Grove City makes their state tournament debut with a tribute to Fire Fighters. The uniform really complimented their long legs and technical kicks. The difficulty of the kick combinations stood out as higher than a team of 10 should expect. The Eagles shined as our newest state team. Cannon Falls picks up the mood with solid kick technique and crisp movements. 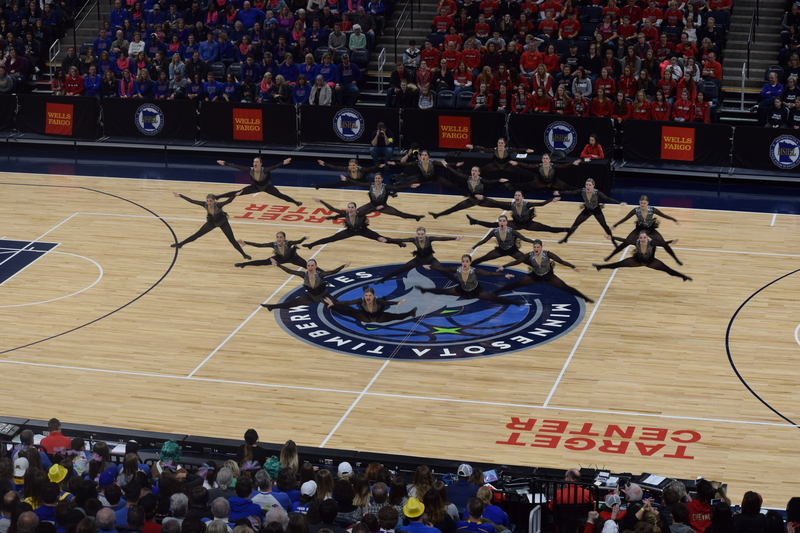 The Bomber dance team brings a rich tradition of excellence in the kick division and showed why they’re section 2A champs. Montevideo starts off the class A kick division with a routine full of energy, fast paced transitions and great use of floor spaces. 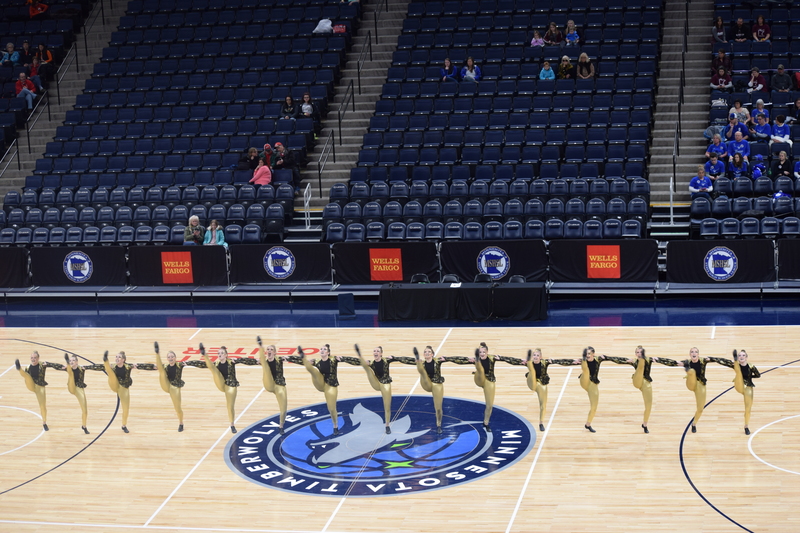 The Gold Dusters come out of a difficult section 3A and set the pace for what we’re going to see today. The doors have been opened and the Class A fans are filling up the seats. 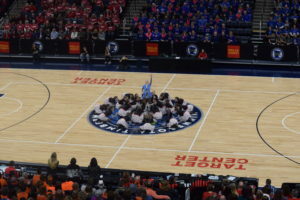 It’s definitely going to be a day to remember with all of the medalists and 17 of the 18 kick finalists from 2018 making repeat appearances at the Target Center. 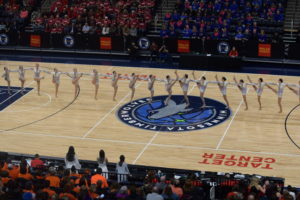 Frazee, Sartell, and Eastview will be dancing to defend their 2018 titles. If the talent at yesterday’s jazz competition is any indicator of how today is going to go, we are in for an epic battle! there was a tie for 1st, with a tie breaker. Here we are, waiting for awards in a very tight field! This year has been one of the best in recent memory, with so many excellent routines that make me want to receive my state “tapes” as soon as possible so I can look for more things that I might have missed in the live performance. Thanks for sticking with us while we all wait for results! 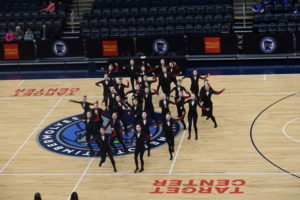 With the last Jazz Performance of 2019, Lakeville North came out with lovely routine. Their lower body technique is filled with such energy, and beautiful lines with extension that goes on for days. The gravity defying moments that this routine is filled with make it pleasing to watch. A wonderful exclamation point to Jazz 2019, Lakeville North really closed out strong in a field of top talent! 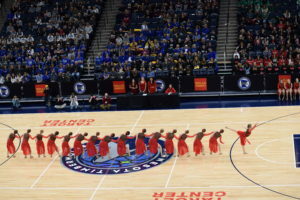 With the last routine of the 2019 State Jazz Tournament, Lakeville North is surely giving us one to remember. Such beautiful lines and extended turn sets make this so pleasing to watch. Lots of gravity defying moments in this one, along with choreography that is just as intense as this song choice. A great exclamation point on a talent-filled field today! Closing out AA is Sartell-St. Stephen, with a routine that is full of unexpected musical moments that make this routine uniquely theirs. It’s highly entertaining, visual, and stuffed full of content. With such a beautiful song choice, it’s a great way to close out AA. This is always one of the most well-conditioned, well-trained teams in AA and this year is no exception. 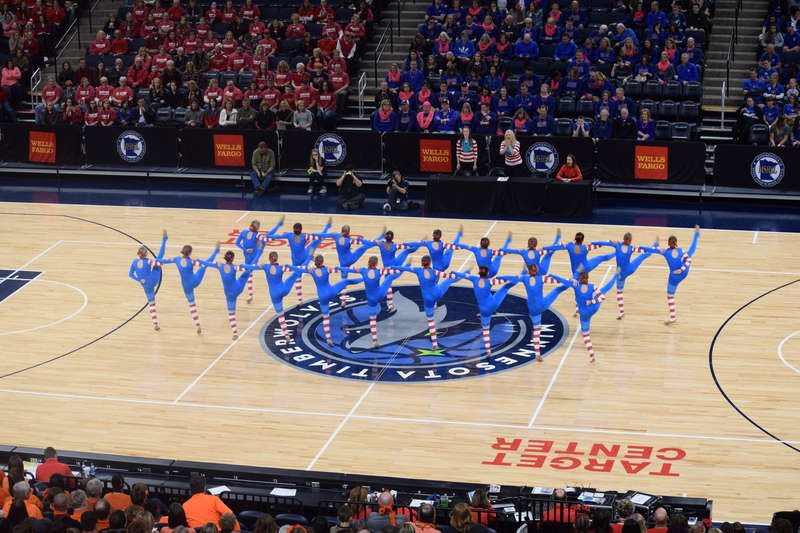 Lovely job, Sartell-St. Stephen! 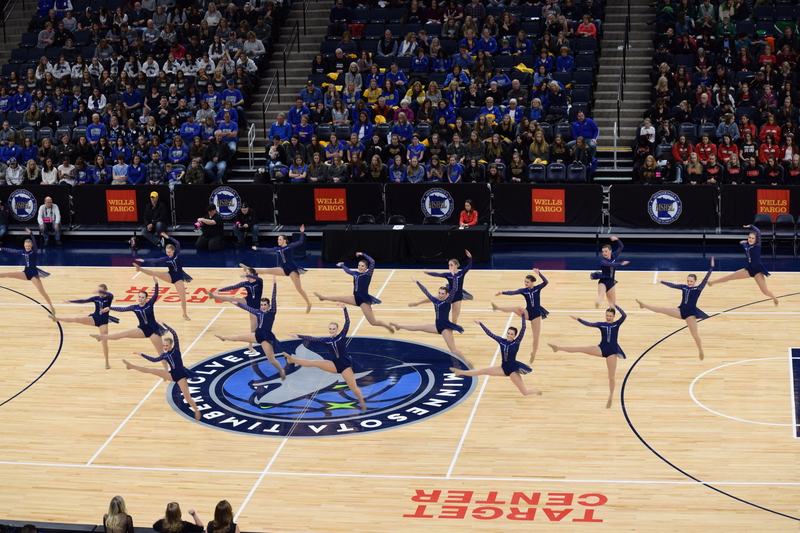 Prior Lake came out swinging with more technique and control than a lot of other teams. Their flexibility, attention to detail, and comfort on the floor is apparent. This routine is one I can watch over and over. Dancing with that finals energy, they poured all of their talent into a fantastic finals performance! The Orono Team made their State jazz finals debut with a statement! Orono pulled us in right away with high content, intricate choreography, dancing with execution and spirit that can’t be contained! Orono should be very proud of that performance! 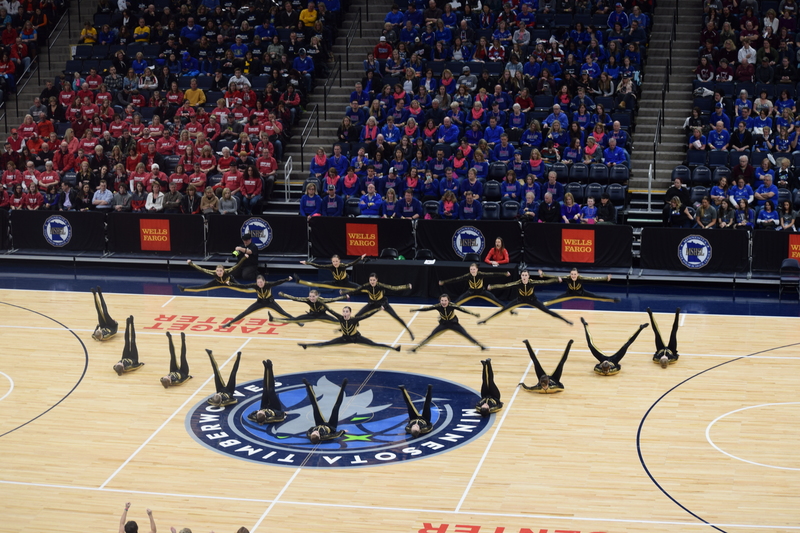 Wayzata starts off with intricate, eye catching choreography that makes their athletes look larger than life. How is it humanly possible to be that flexible? Turn sets are incredibly well executed, making me want to see more and more. I love seeing the lower body turn technique being so en pointe. This is a highly entertaining dance that is more than entertaining; it makes a statement. Beautiful, Wayzata! 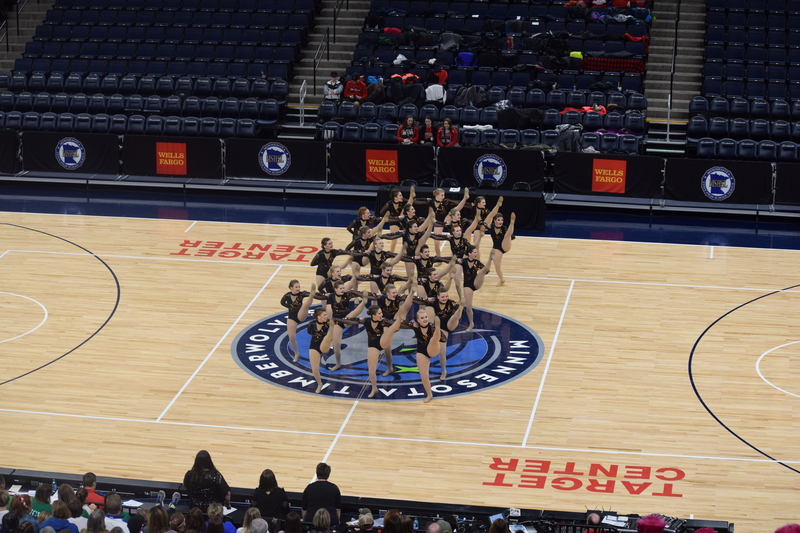 Benilde-St. Margaret’s shows that their finals experience is paying off. Variations of turns with rotating spots, landings, and arm placement reminds us of just how good these athletes are. It’s fun to watch Benilde take more of a risk with music, choosing something more instrumental and intense. Beautiful routine, BSM! Edina is dancing with a passion I’ve not seen out of them. Extensions are full of energy, each muscle has a purpose. Edina’s group turn sets are effective, difficult, full of variation, and being executed with precision. The execution of this team is impressive and very Finals-worthy. Wonderful routine, an instant re-watch for me! As a sometimes Jazz finalist, Faribault is really showing us why they earned their finals spot this year. Jumps and leaps have always been this team’s strength, and this year is no different. Full of fun moments in a great song choice, a very entertaining finals performance from an athletic team. Great job, Faribault! 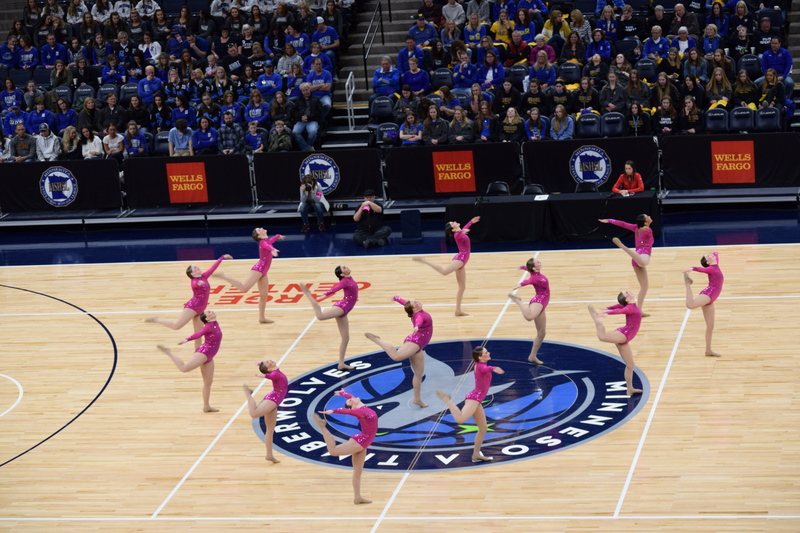 The Eastview Lightning Dance Team is pulling all of the heartstrings with this creative, beautifully executed jazz routine. Their intricate formations capture my attention. The skill of this team should not be overlooked; these athletes are absolutely hitting this routine which is full of difficult execution; imaginative lines, placements, insane skill sets. It’s so entertaining, beautiful, and fiercely competitive. 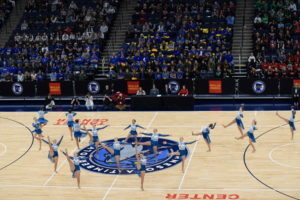 Well done, LDT! Totino Grace is back with their Queen routine, featuring Bohemian Rhapsody. This routine features Totino’s classic fluid choreography, combination difficulty, intricate attention to detail combined with an intensity that would make Queen proud! Turns are being HIT, group work is unexpected and effective in this fun routine. 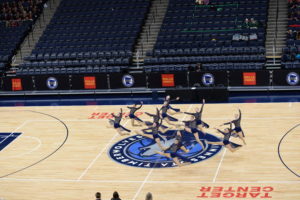 Great job Totino-Grace! 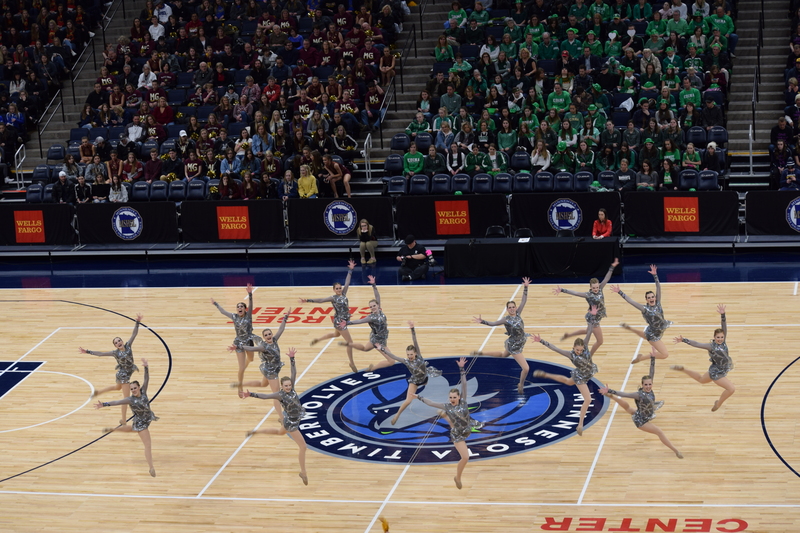 Maple Grove opens AAA Jazz finals with even more energy than they had in prelims, which I didn’t think was possible! The intricacy of this routine gave me goosebumps on a few big hit moments. Combinations and difficulty with unique preps, spotting, and skills make this routine memorable and a beautiful start to AAA. 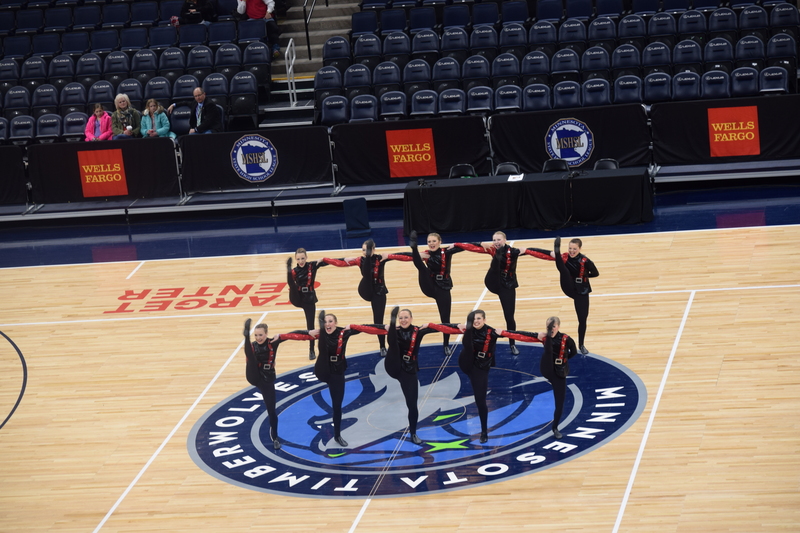 Taking the floor to kick off AA jazz Finals, Mound Westonka looks confident! 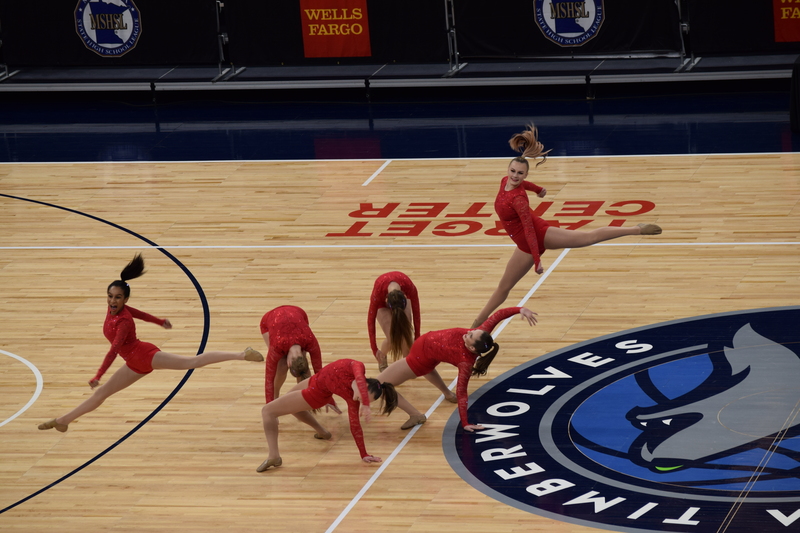 An intense opening with some spot on group work and jumps that are practically hitting the ceiling, Mound Westonka is dancing better than their prelims performance. Lots of “wow” moments for me as I watched, including some great choreography choices highlighting the flexibility of this team. There’s something about a Finals energy that brings every team up a notch. Fans are starting to challenge each other to cheering contests. The Wave is starting around the Target Center. The spirit of sportsmanship is alive and well! Here comes Chip, back to take his throne behind the switchboard of music controls. It’s about that time! I spy teams in the chute – it’s almost time for AA/AAA to begin! Get comfortable and ready for the exciting conclusion of 2019 State Jazz! Congratulations to all Class A Jazz teams on a great tournament! Amazing routines and sportsmanship as always from Class A. Stay tuned for AA/AAA finals coming soon! The All Tournament Team recognition awards are being announced. Two students from each finals team have been nominated for this award and will be recognized at this time. Congratulations to all members of the All Tournament team! Class A teams are taking the floor for awards! 2019 Class A Jazz has been completed! The awards table is being moved to the floor in anticipation of awards. What a great field of talent this year. It’s going to be close; I can’t wait for the presentation of the top 3! We should be underway with awards shortly! Closing out 2019 Class A Jazz Finals is Duluth Marshall. This team’s creative dance that drives home the moral responsibility to help end mass violence strikes a chord with the audience, leaving the routine effectiveness high. Combinations are well placed throughout the routine, while extension and flexibility on this team is notable. 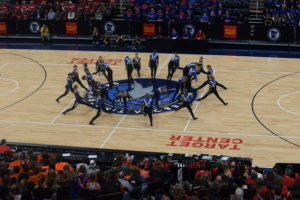 Last year’s runner up, Lac Qui Parle Valley-Dawson Boyd is out for blue this year as the intensity of their opening sets the pace for this dance. The smart choreography choices leave me guessing what will happen next. This is a team that has invested in technique and it shows with those turns, leaps, jumps. Creativity with levels, moves, and skills really sets this dance apart as a classic. 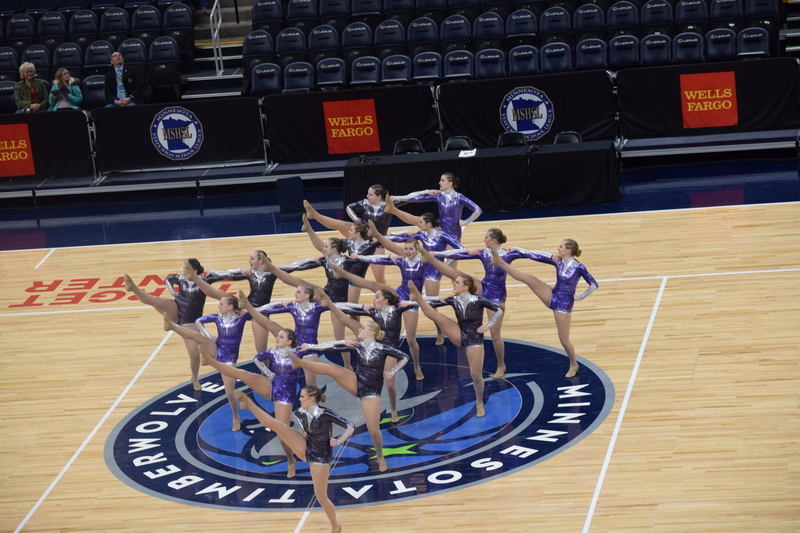 The Aitkin All-Starz, a veteran Finals team, pulled our attention right from the start with a beautiful solo, followed by some group turns. Upper body technique on turns is very nice on the Aitkin team, which shows that they are executing with purpose and intention. Creative choreography shows off the talents of this team. Great job, Aitkin! The 2018 State Champions, Frazee, are returning to the floor for 2019 Finals, hoping to defend their title. 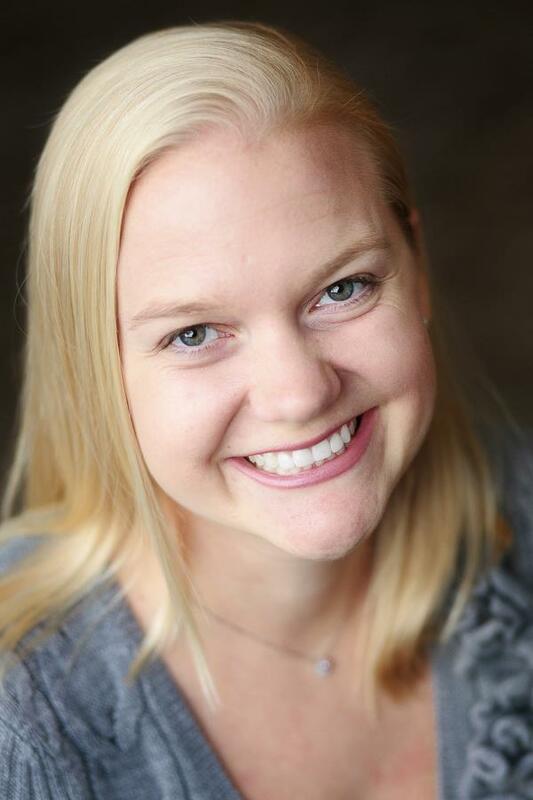 The Frazee team’s routine to “Jack & Diane” is fun, nostalgic, and competitive. The Fly Girls finals routine has the fire of a team that wants to win. 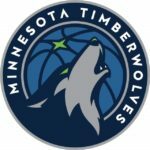 Technique for Frazee has improved year after year. The sweetness of this routine makes this a crowd favorite. Difficulty is showcased with full body movements and combinations. Nicely done, Frazee! Yellow Medicine East takes the finals floor with the confidence of a team who knows the finals feeling. The sharpness and motivation of each move is what got them this far and shined tonight. Great finish to the jazz season for YME. Zumbrota starts of A finals with a much stronger performance than prelims. Formations, turns, alignments…you name it and it’s taken a step forward for finals. nothing beats the magic of a finals performance that is truly your best. 2019 Jazz Prelims is in the books! Congratulations to all teams advancing! There will be a break, with Class A Finals slated to begin at 5:30! The AA Fans are clearing out, making room for the A fans to come in for finals. 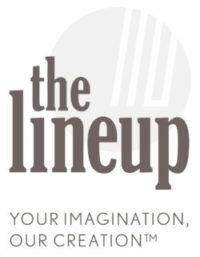 AAA Jazz Finalists to be announced shortly! 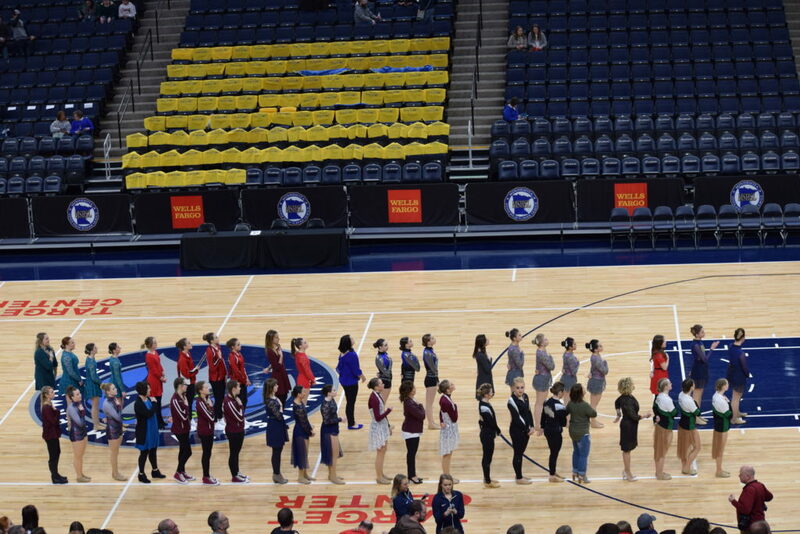 2019 AA Jazz, Finalists in Order of Performance. We’re getting close! Fred has called for fans to start taking their seats for AA finalist announcements. 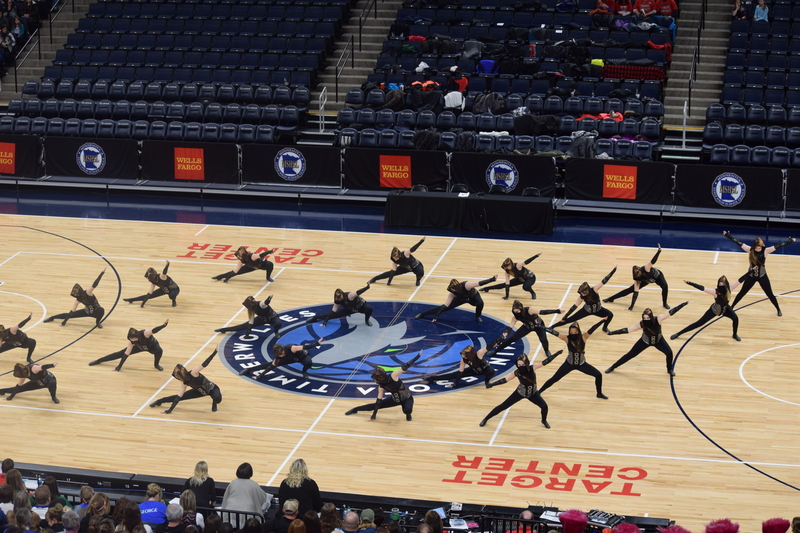 As usual, I am blown away by the amount of talent that the Minnesota dance family has. What amazing routines and performances by all the teams today. The tournament this year has brought on a lot of nostalgia for me, and not just because there are so many of my favorite songs out there! But I gotta say, am I the only one slightly annoyed and jealous of the makeup and costumes that the teams get to wear these days? Why can’t everyone live through high school without YouTube makeup tutorials and heavy, sequined costumes (circa 1990s)? Every year, the performance level is elevated and I can’t believe that I’m watching high school kids with the talent of the best colleges (and professionals) in the nation. And that’s that! 2019 Jazz Prelims are officially completed! There will be a short break for judges to finish tabulating before the teams are brought back out to announce the finalists for this evening. With the final Jazz routine of State Prelims 2019, Spring Lake Park closes with one of the best routines I’ve seen from them in a few years. I enjoyed seeing their sneaky transitions that took us to new formations with just shifting a few athletes. Interesting showcase choreography in the last 1/3 of the routine gives us a peek into the overall talent of this team. Austin closes out AA Jazz Prelims with a cute, upbeat routine to U2’s “Beautiful Day”. A nice drop off turn set ending with an illusion was a fun treat in AA. 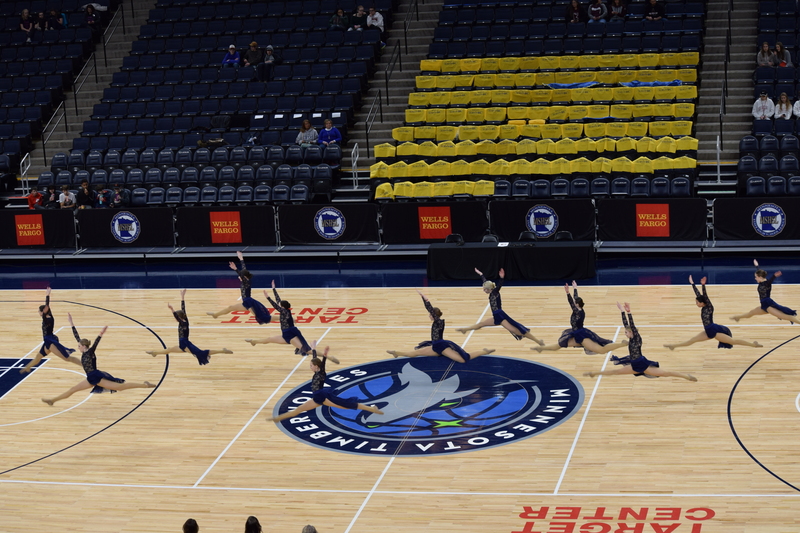 Fun to watch, skills spaced throughout the routine and tight jumps make Austin’s return to jazz a strong one. Wayzata comes out swinging to “It’s A Man’s World”, showing us again why they are consistently one of the best programs in the state of Minnesota. Turns are lifted, leaps and jumps are high. Difficulty is some of the strongest I’ve seen all day. Wayzata owned that routine and had the audience engaged! Well done! Hermantown Proctor makes an epic debut state performance with a sharp costume skirt change to match. Lovely extension and a beautiful presentation style completed a great start to a state career. St. Cloud Tech brings out another of my all time favorite Celine Dion songs! Their choreography to “It’s All Coming Back To Me Now” is well thought out and danced with a full heart. It’s nice to see St. Cloud Tech back on the jazz floor. 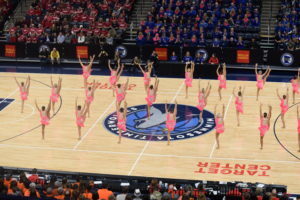 Great job, Tigerettes! Mound Westonka shows us why they’re section champs! Their timing & accuracy is showing that they are fighting to “survive” another round of prelims and want to make finals tonight. A beautiful add-on turn and their use of music shows that Mound Westonka is legit. Centennial warms the audience up with a lovely version of “Tiny Dancer”. 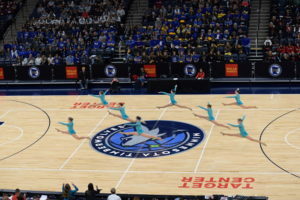 This routine shows well on the floor, as smart choreography choices are shining through. Their execution of the dance as a whole is lovely, with the team achieving and checking off a lot of boxes on the score sheet. The Marshall Tiger Dance Team comes out showing us strength and intensity right away. This team is a state veteran and it shows by their commanding presence on the floor. Well executed turns showcase the talents on this team. Nice job, Marshall! Lakeville North starts out, letting us know that they can refresh an old classic, “Alone” by Heart (performed by Celine Dion?). The interesting remix and creative use of music is something I love to see. Their skilled pirouettes just make this a beautiful routine to watch. Lakeville North’s jumps and overall routine are top notch! Sartell-St. Stephen looks like an army out there! 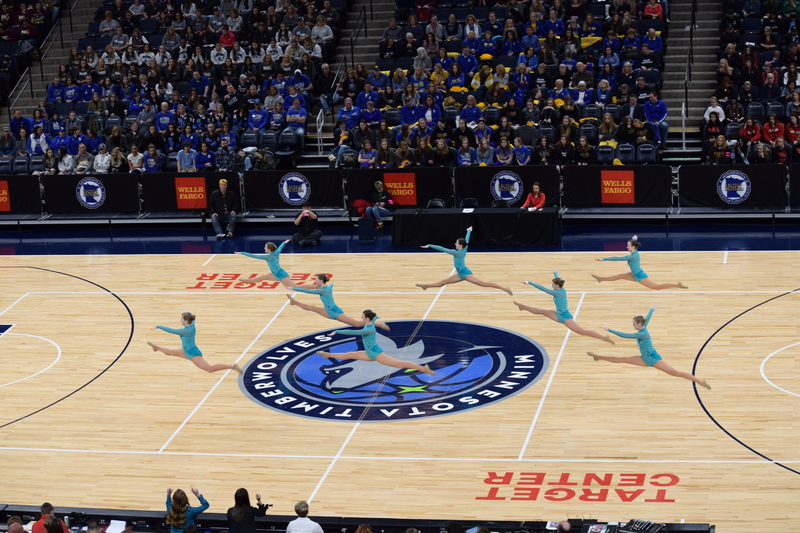 This is a team that knows how to play to numbers, making great choreography choices, extending with beautiful lines, using every inch of this floor. A visual routine that has tons of difficulty make this routine one I’d like to watch again! Prior Lake shows why they fight with their beautifully choreographed routine to Pink’s, “Wild Hearts Can’t Be Broken”. Surprising group work, non transferable moments, keep me hooked and wondering what will happen next. Well done, Prior Lake! Benilde-St. Margaret’s comes out with an emotional routine, intense movements, and a moment that grabbed me from the start. Great sets of difficult turns and overall complexity makes this a nice prelims performance. Edina shows us exactly how ladies get it done in their, “This is Women’s Work” routine. 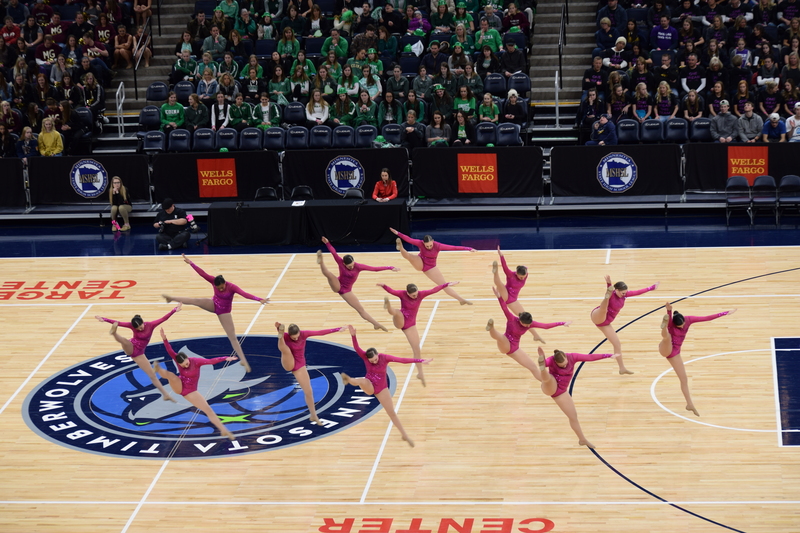 Inspiring choreography, lots of showcased talent, and an impressive pace to their skilled turn sets make this a strong routine from Edina. Will we see this one again tonight? Time will tell! 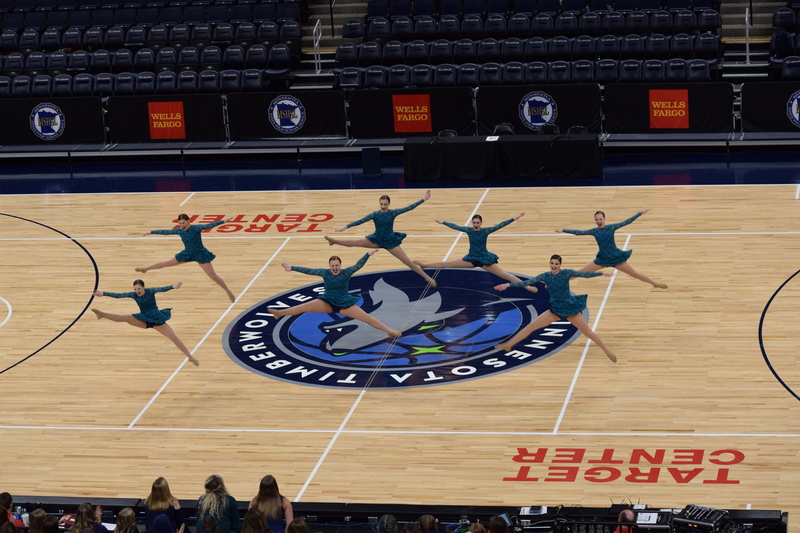 The Faribault Emerald Dance Team comes out to show us who they are in an upbeat, engaging routine to “This Is Me”. 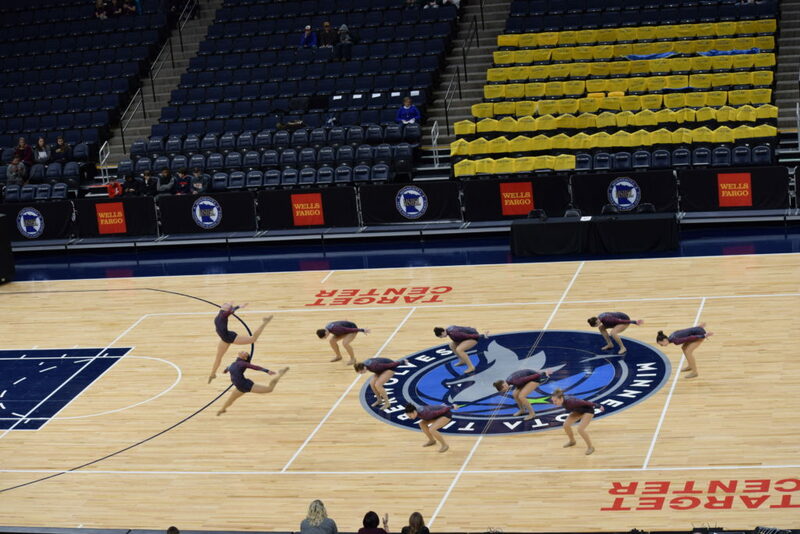 This jazz program has really started to step up to another level in the past few seasons, what a transformation. Difficult combinations and height on leaps makes this high energy routine soar. 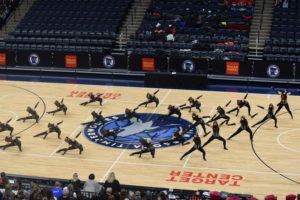 The Anoka Twisters are starting strong, really starting to bust out of the woodwork in the last few seasons. They make this intricate choreography look effortless with difficult turn sets. I see you, quadruple choreography. The Twisters are certainly making a strong showing, fighting for a spot to dance again tonight. A fun mix that starts with a great version of “R-E-S-P-E-C-T” has Rocori’s energy and spirit jumping off of the floor from the first beat. Those 10 athletes have choreography that takes them all over the floor, making it look like they have twice that number. What a great job on spacing and formations to be able to achieve that! That was a fun, competitive routine, Rocori! 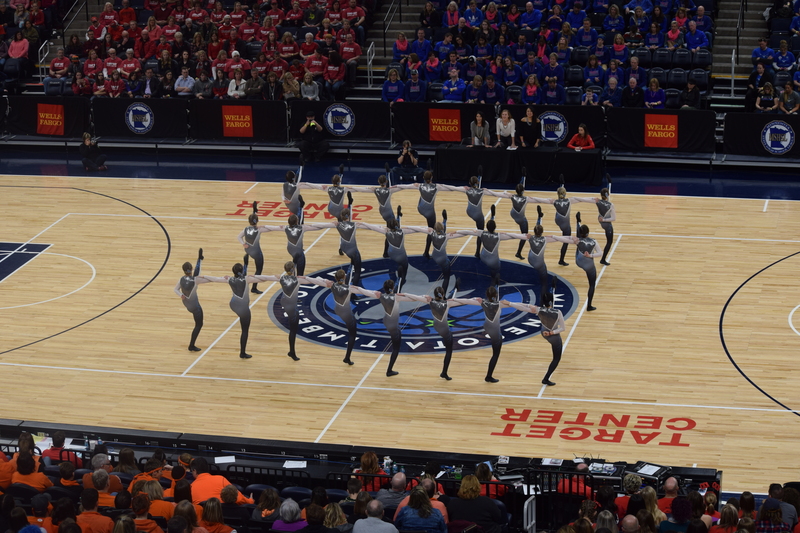 Interesting music and a wow moment from the start makes me wonder what you’re up to, Mounds View! Some nice variations in arms on turn sets are a fun change from the usual that we’ve been seeing today. Accuracy is a strong point with this team. 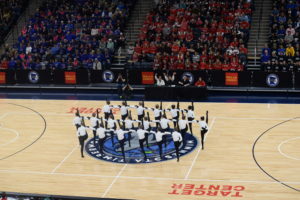 great job, Mounds View! Totino Grace really shows us what “killer queens” they are with a great version of Queen’s ‘Bohemian Rhapsody’. From the classic Freddie Mercury jackets to the smart choreography choices that Totino Grace excels at making, make this one an instant classic for me. Great job, E’Gals! 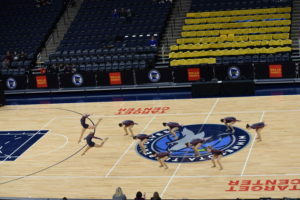 I always look forward to Maple Grove jazz for the beauty and athleticism that they showcase. The strength behind the movements really connects the audience with the athletes on the floor. Interesting choreography, turn sets that are lifted to the stars, and consistency that I love to see make Maple Grove a top team, once again. St. Cloud Cathedral is making a great showing, with big movements, lots of difficulty distributed throughout the routine, and the emotional element that pulls at your heartstrings. Always a fun team to watch, I appreciate the visual elements that Cathedral worked into this year’s routine. 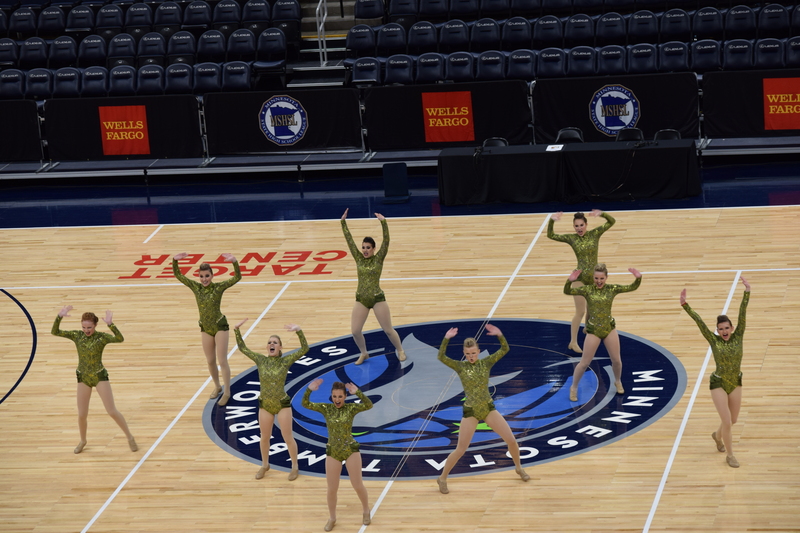 Perennial powerhouse Brainerd comes to the floor with a fun “audition” mix that is full of great songs that is like a stroll down memory lane for us veteran dance teamers! The Kixters have really stepped up their execution, showing all the beautiful lines and training that has very clearly paid off for this team. The different styles mixed into this routine easily make it onto my “must see again” list for Jazz 2019. 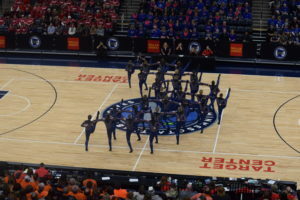 Simley pulls out a classic tune, “Holding Out For A Hero”, and gives it a twist with updated, surprising choreography. I think that they are taking flight with those leaps! Lovely floor work and interesting group work round out a great routine from Simley. 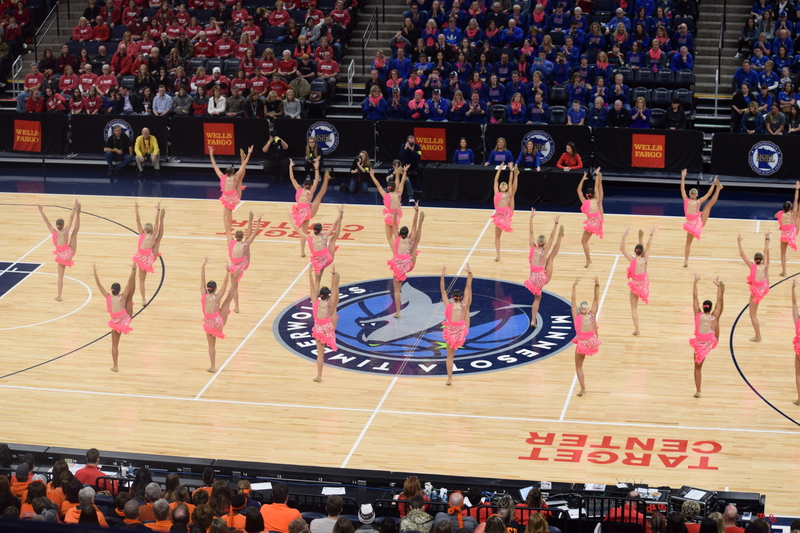 Eastview’s “fire” from the first move shows why they are one of the best teams in the state year after year. Technique is always a strong suit from this team and this year is no different. Turn combinations are difficult and beautiful. The kaleidescope formations that I’ve come to look forward to from this team are executed flawlessly with a choreography that pulls me in until the last move. Well done, LDT! Orono makes a strong first impression with incredibly tight execution and visually pleasing choreography. 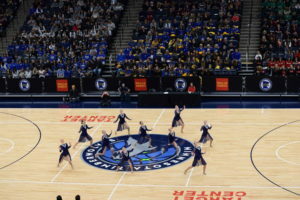 Interesting group work and intensity I can feel in the back of the Target Center shows that Orono is more than happy to be here – they want a finals spot. The floor has been cleared and we are going to be underway in just a few minutes! Settle in, it’s going to be a great afternoon of jazz. I can hear the Orono team cheering in the chute, the extra coaches and alternates have settled in the seats, and 2019 AA/AAA Jazz Prelims are underway! AAA coaches & captains recognition, National Anthem to commence shortly! Announcement of AA coaches and captains has begun. 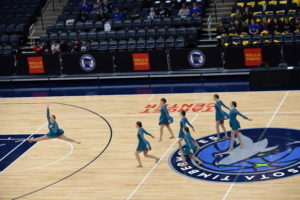 Class A State Jazz, Final 7-12 placements. Well, that’s it for Class A Jazz Prelims! What a great group of athletes! As the Class A fans are clearing out and making room for the AA fans, now is the time to refresh your snacks and beverage and get comfortable for what is sure to be an unbelievable AA and AAA Jazz Prelims. One of the questions I’ve received as a former coach is, “What the heck do the teams do in the time between prelims and Finals?”. While the answer varies widely between coaching staffs and styles, it’s usually a full range of emotion that starts with joy, which then moves to hunger, score analysis to see what could possibly be focused on to improve scores from prelims to finals, hair and makeup touch up, and some intense focus to make sure you are ready to end the season with your team’s best routine. Our announcement of Class A Jazz Finalists in just a few minutes! 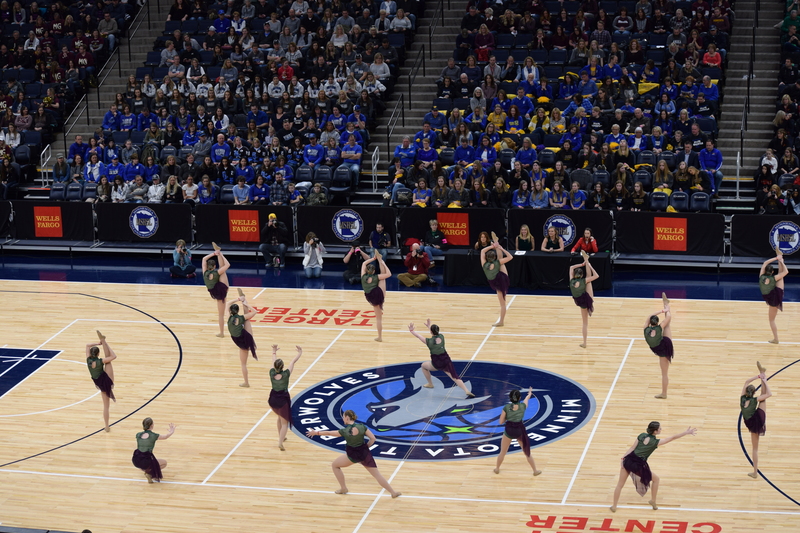 Richfield makes its second consecutive state appearance as our final Class A jazz performance. The Tapaires utilized the intensity of their music and had some good floorwork and level choices that made “survivor” intense. Montevideo makes their state jazz debut with Re-write the Stars. I had seen a Montevideo jazz dance in a few years, and the program has certainly come a long way since then. The gold dusters had both energy and lovely expression that suited their strengths. The ending coda to the music and walkoff were memorable as well. Zumbrota Mazeppa had a lovely and pleasing version of Tiny Dancer with some of the most consistent technique we’ve seen today. I always felt like they chose to stop turns, rather than having to stop because they couldn’t do more. Thats not an easy feat for a school with barely more than 200 students. Class A continues to impress today. The Shadows take us to the jungle with some really smart choreography choices that keep us guessing what will happen next and really flatter the skills. The heartbeat tempo double box was a highlight of the day hands down so far. This one was an instantly re-watchable. Cannon Falls makes us “believe” with a high energy Journey rendition. The Bombers had snappy leaps and jumps and really stuck their turns today for a polished and enthusiastic overall impression. Aitkin had noticeably well planned formations for their jazz presentation. Paired with powerful leaps and confident turn sequences, the All-Starz looked solid today. Duluth Marshall brings the tears in a moving routine about mass violence acts. Duluth Marshall always has a high level of skill and content, even with a league minimum 5 member team. Expression, passion, and heart were certainly big enough for this room. YME is one of those who never misses a chance to “show up” at these big moments and they did that this morning. 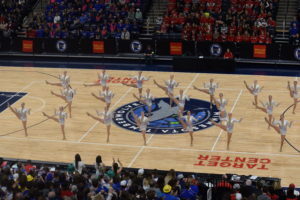 I saw some skills I have not seen in MN dance team before, which was a nice surprise. Interesting moments, choices, and lots of drama made this one a classic for them. PACT Pantherettes bring us a dream with their “Sandman” routine. Haunting and expressive, with elegant turns and some lovely flexibility moves that complimented the theme. St. Charles wows with a lovely and technical routine. I see you full box turns 🙂 difficulty sure has been high to start off the day. The St. Charles program has been building into a strong finalist contender year after year and look like they’re going to score strongly for that goal of finals again this year. A few items of interest before we begin. 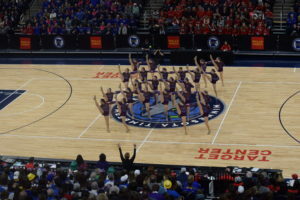 This is the 22nd year of the State Girls Dance Team Tournament under the MSHSL. We moved over to Target Center in 2009. 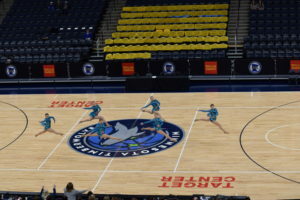 The wolves home floor is 5′ bigger on each end than a traditional high school floor, but the volleyball lines have been added to aid teams in formations as more “normal” for them. and we’re underway with the pre-tournament handshake for class A. we’re ready in a few minutes! 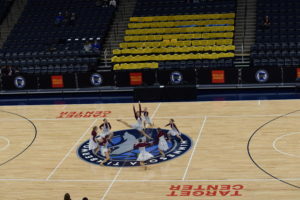 Welcome to the 2019 State Dance Team Tournament! We’re wrapping up marking times here at the Target Center and we’ll be firing up the live commentary all day from the event. Totino Grace, Chaska, St. Cloud Cathedral, and Anoka! Faribault, Eastview, Austin, and Wayzata! Sartell St. Stephens, Prior Lake, Benilde St. Margaret’s, and Lakeville North! 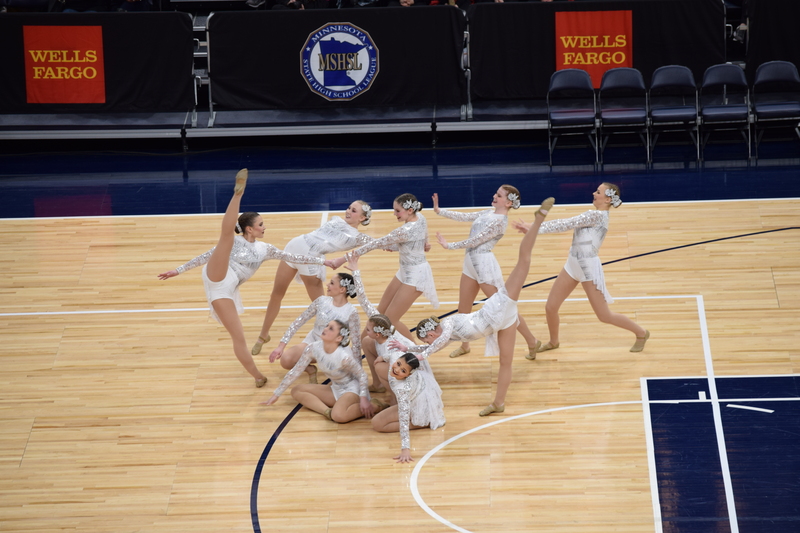 Anoka finishes off our Class AAA kick competition with a strong and piercing routine with flawless kicks and combination execution. Leap skills were impressive and visually pleasing, but their moving kick lines made this team really stand out. The control from these girls was intense and consistent, and closed down the day with an unforgettable performance from the Twisters! St. Cloud Cathedral brought their historically accurate and technically sound kicks to the Finals floor. Such wonderful control and consistency across the whole team. Great floor work in the one line kicks and loved the transition during the hip hop music breakdown! 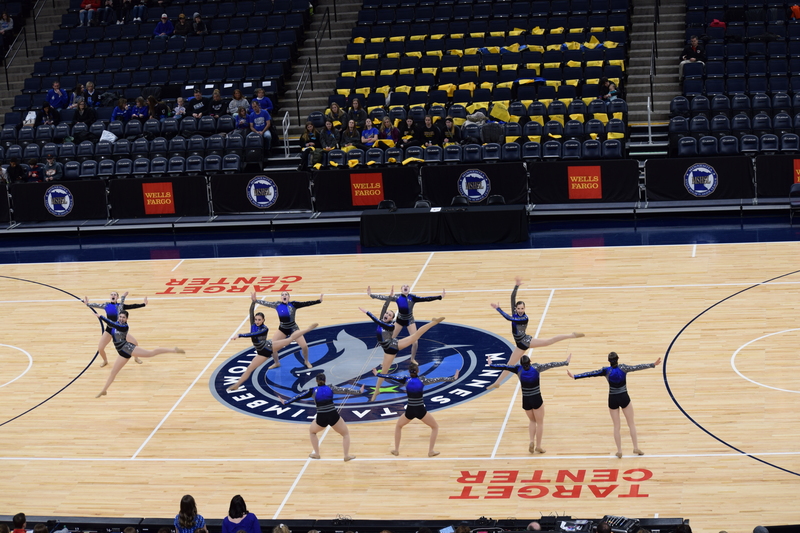 Great foot work and kick line choreography in the ending kick sets – made this dance a clincher for the Class AA kick competition! 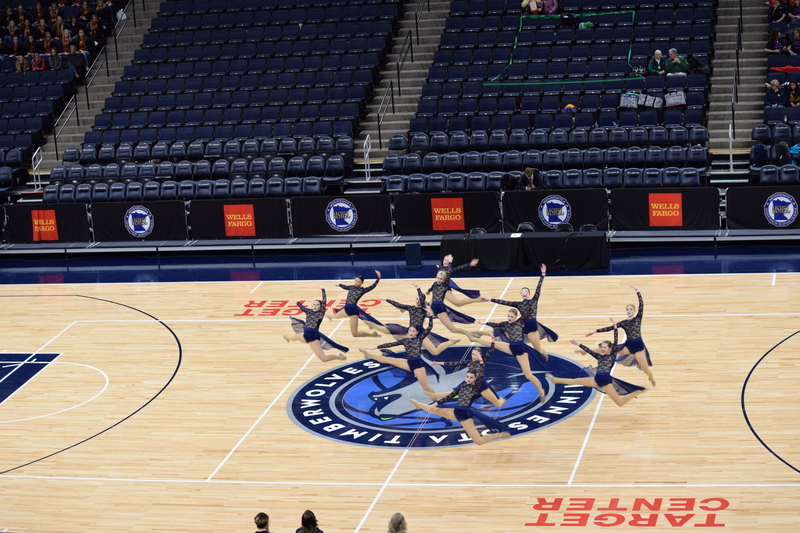 Totino Grace always turns up their performance in Finals which is always fun to see as it looks like a whole new dance! So sharp and more intricate than before! Kicks were technically sound and their skills in between kick sets was beautiful. Love the overt theme and formations/choreography with the church references, but super HIGH ENERGY! Great job E’Gals! 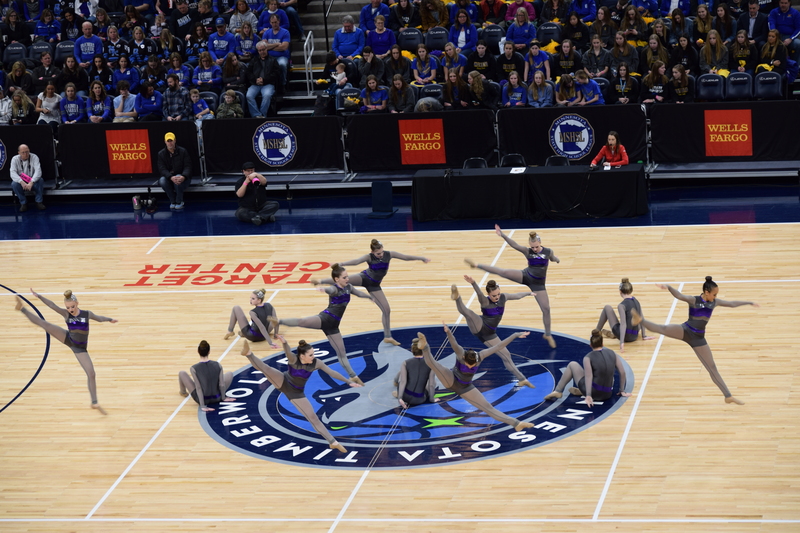 Chaska stands out with their difficult transitions with moving stationary kicks. More intricate and with very different upper body positioning and arms from others – hard to execute and they did it very well. One line kicks and choreography were spot on, and the science formations and references were so fun to see. Awesome Hawks! 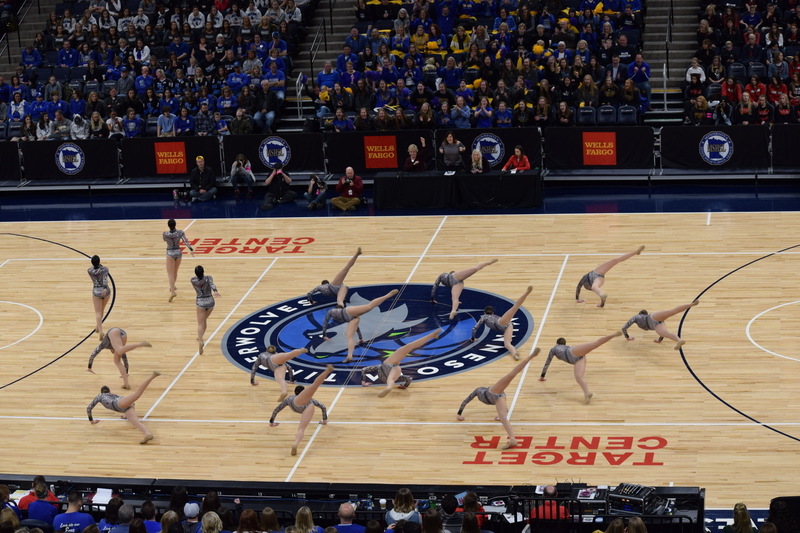 Wayzata’s dance was just so engaging and creative! What interesting formations to form the countdown that lasted through their whole dance! Kicks were well timed and executed very well, even through difficult combinations and transitions. Spacing was a huge strength with this team with how unique everything had to be to pull off the theme – LOVE it Trojets! Austin’s routine was full of fun choreography and partner work from beginning to end that made the dance very fun to watch. The music was very up-tempo and the girls kept up with it just fine with extremely sharp kicks that were high and placed correctly! Loved the stationary kicks towards the end – timing was perfect. Amazing job Austin! 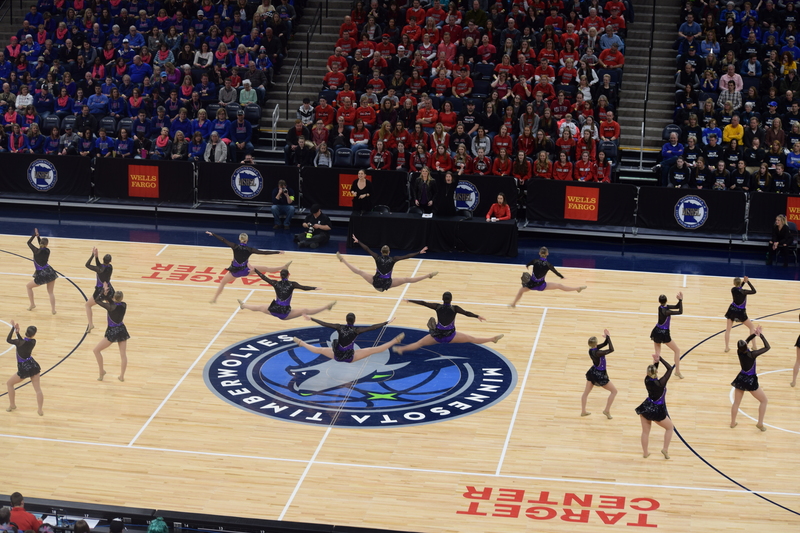 Faribault’s dance was diverse and had a lot to offer the crowd! Amazing kicks, fun choreography, costume changes, the works! The choreography towards the end during “He Had it Coming” song was so fun and creative! Loved the musicality of the choreography, great job ladies! 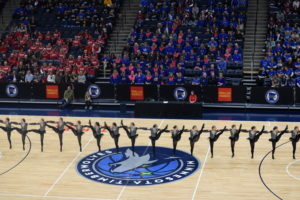 Eastview, how can you be so sharp and fluid at the same time?!?! Loved the intricate salsa dancing in the transitions! Formations moved quickly and the team never stayed in one spot for longer than a count of eight. 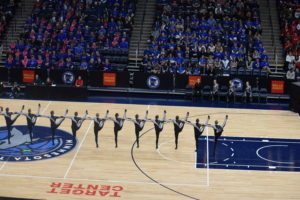 Skills in the one line were well displayed with stunning kicks and extremely difficult choreography in between. Quite amazing ladies! 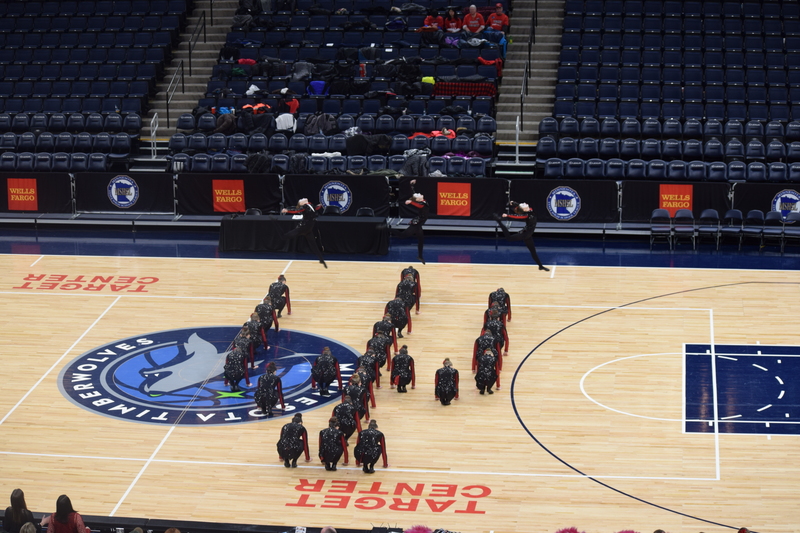 Benilde St. Margaret’s brought a new level of energy to this floor! Love the music note formation and stationary kicks that followed. Great turn into a link-up! Their kicks were incredibly sharp up and down and stayed strong until the very end. Also loved the choreography between kicks, cute and fit the theme well. Awesome job ladies! 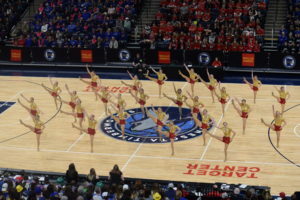 Lakeville North was trying to kick ME in the face with how high their kicks were! Great formations and turns from this team – very visual and precise! Loved the part where they link and walk over the girls in their team. Kick technique was top notch and will be hard to beat, loved it ladies! Prior Lake – SHARP! Toe touches were out of control high and kicks were placed and timed beautifully. Transitions with kicks were very clean and diverse from each other. The kick set at the end into the one-line was perfect – a great way to end this routine. A strong start to AAA, great job ladies! 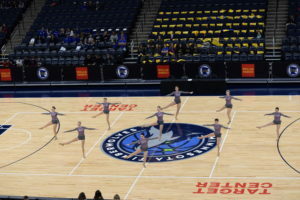 Sartell-St. Stephen’s dance had a new level of sharpness to it in the Finals competition. Great fan kicks – timing was dead on and placement was terrific. 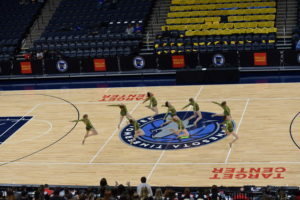 Foot work was sharp and choreography was executed with a vigor that wasn’t there in prelims. This team wants to place! The crowd went wild for this routine, nicely done Sabre Dancers! See you at 7:15 for Class AA/AAA Kick Finals! Frazee, Cannon Falls, and Lac qui Parle Valley Dawson Boyd! BOLD, Aitkin, and Yellow Medicine East! Lac qui Parle Valley Dawson Boyd finishes the Class A kick Finals with a great performance with lots of energy and stamina! Loved the leg extension in the beginning that is held as it lowers to the ground – so difficult! Great choreography in between kick sets – very different and unique to this team! Loved the ripples near the middle of the dance! Great job Shadows! Cannon Falls – this hole can’t stop you! They came to the floor determined to make their mark! Kicks were so sharp and clean! Transitions were smooth and timed perfectly, beautiful. One line kicks were amazing – very precise with consistent height! 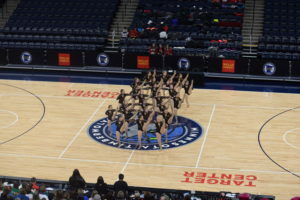 Choreography was confident and left a great impression on the floor, well done Bombers! 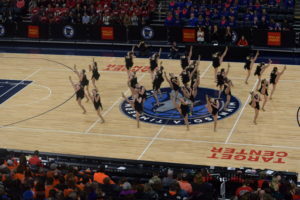 Frazee’s dance is just wonderful and a welcome change in choreography and theme to kick! Their kicks were so sharp and well executed, but their kick combinations were so difficult and unique. They hip hop choreography was very well done and sharp as can be! Loved the crossing kicks in the one line. This dance is so different and wonderful, love it Fly Girls! Who are we? YME!!! These girls hit their kicks and choreography stronger than in prelims! Transitional choreography was very controlled and creative. All of their song choices were crowd pleasers. Loved the section of the dance after the one-line! Ending kicks were technically sounds, great job Silhouettes! Aitkin’s dance is a great example of strength and creativity. Kick sets got stronger and stronger as the dance progressed with great kick height and timing. One line kicks were very well executed! A lot of power in this team’s arm movements and upper body movements in their choreography. Overall, a hard performance to beat from the All Starz! BOLD brought their A-game to the Finals floor, much stronger performance than in prelims! Their kicks were much more consistent and movements were very controlled and precise. Loved the ninja choreography and transitions! This was a performance from a team who wants to medal a second year in a row, nice job ladies! Class A Kick Finals start at 5:30, see you then! St. Cloud Cathedral, Wayzata, Rocori, and Centennial! Mound Westonka, Anoka, Simley, and Spring Lake Park! Faribault, Brainerd, Marshall and Lakeville North! Orono, Eden Prairie, Zimmerman, and Eastview! Totino Grace, Prior Lake, Benilde St. Margarets, and St. Cloud Tech! Austin, Chaska, Sartell-St. Stephens, and Henry Sibley! 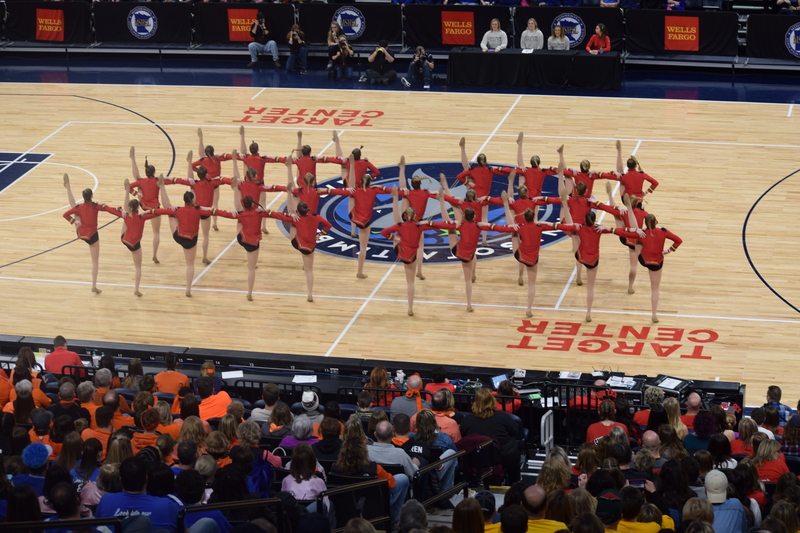 Rocori rounds out the Class AA kick prelims with a strong dance . Loved the formations and choreography during the Missy Elliot section of the dance in the middle! Great use of the full floor with interesting formations and transitions! The hip hop movements were well executed and brought a new element to this dance to help it stand out. Great job ladies! 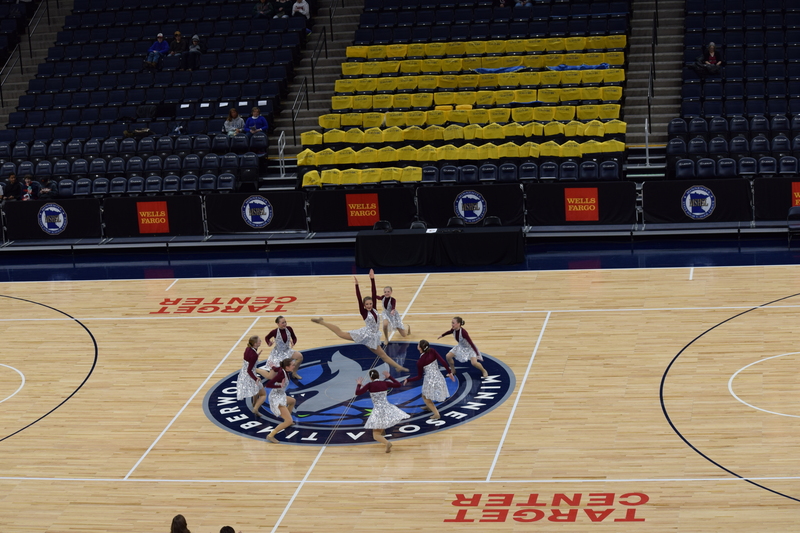 Centennial’s dance was a perfect way to end the Class AAA kick prelims! Great transitions and different choreography! One line kicks were strong and the extension was well executed! Formations were creative and timed perfectly. Kicks were also consistent and placed very well – a total package. Awesome! St. Cloud Cathedral still has some of the best stationary kicks in Class AA. Great kick combinations and foot work worked into each one. Loved the lollipop choreography and formations! Such strong execution from these girls – great kicks integrated into their floor choreography, very impressive Crusaderettes! The Trojets have complete control over every muscle in their bodies! Great kick control and placement! Loved the theme and the count down integrated in their formations, so fun and creative! 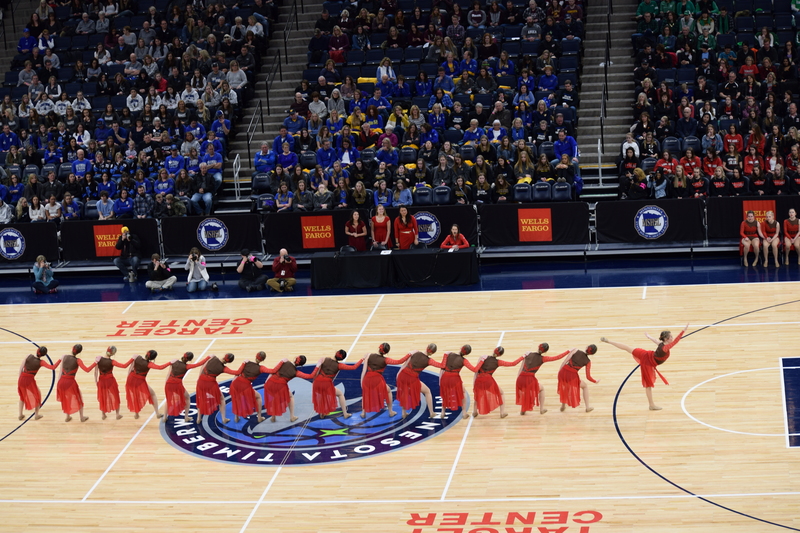 This dance has the perfect combination of great movement and well executed skills and kicks, loved it Wayzata! Simley – be still my heart. You had my undivided attention from the first eight count with this amazing theme. So many fun moments with the choreography and formations! Kicks were well executed and difficult as the combinations were tough! 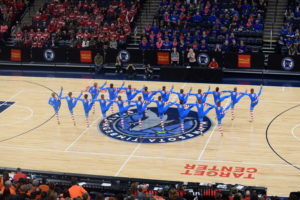 I couldn’t help but smile from ear to ear through this whole routine, thank you Simley! Spring Lake Park’s dance displayed truly wonderful kick height and sharpness. Movements were placed perfectly and timed very well. Loved how the team moved from side to side using the whole floor! Nice use of jazz technique and choreography in a visual way, a strong routing from this team. Great job! 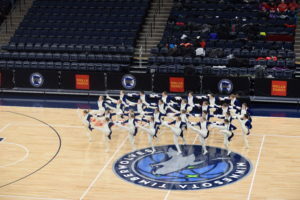 Anoka dance was full of fun water reference in their movements and formations. Great kick technique and placement. The turn set was well executed. Great kick set in the wave pattern towards the end as it moved and stayed fluid – very different from other dances! Excellent job Twisters! The Marshall Tiger Dance Team brought a very fun and detailed dance to the floor. A strong one-line combination of kicks and choreography! Great arm movements in the un-linked kicks – very difficult to master and these girls did it! Strong toe touches fro the full team as well, great job! 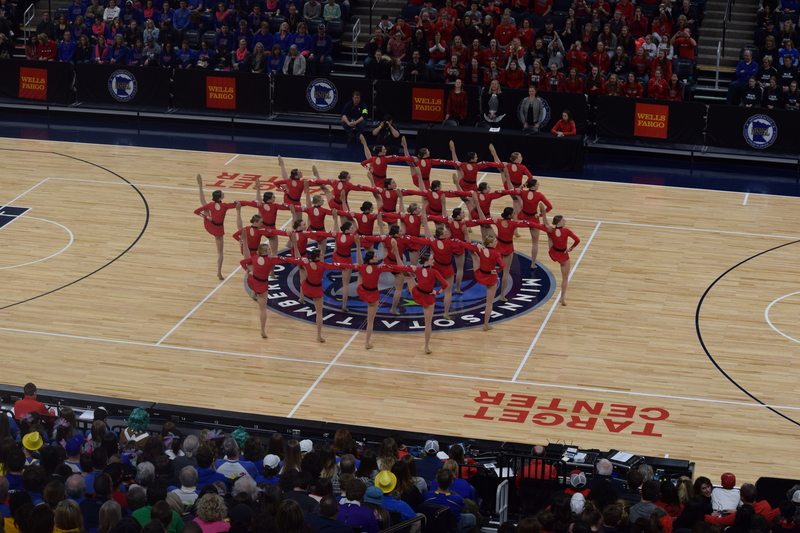 Lakeville North takes over the whole dance floor with their formations and choreography! Very impressive transitions and arm movements creating lots of visual moving moments! Great turn execution and musicality! Kicks were consistent and high. A great display of fluid transitions and flawless link-ups. great job Lakeliners! 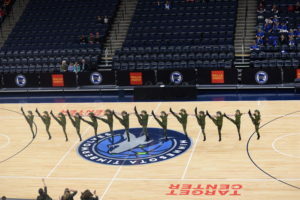 Faribault never disappoints with their kick technique. Kicks were difficult in combination and timing. Great energy from the team and song choices was wonderful! Loved the subtle change in costume to add the color to the routine! A strong solid dance that will be tough to top, nice job Emerald Dance Team! 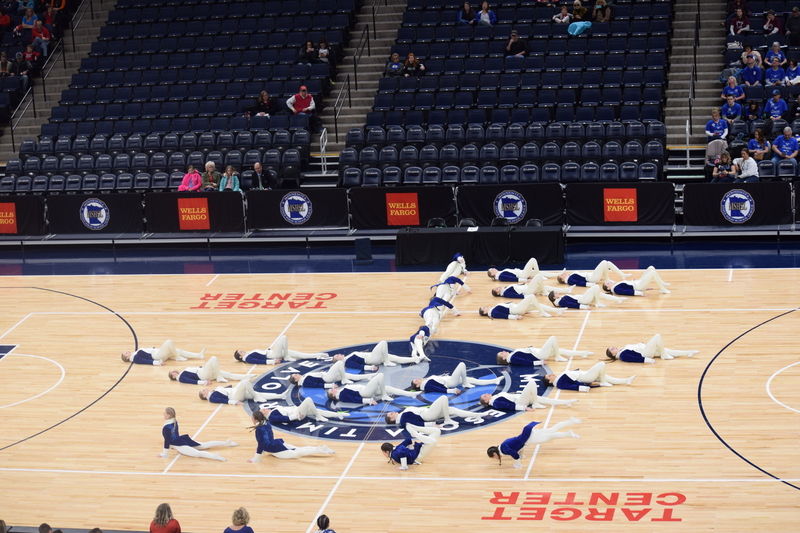 The Brainerd Kixters always bring such great formations and transitions to the State floor. Kick technique was top notch and difficulty was right up there as well. Such diverse movements and skills displayed in this dance. Loved the Michael Jackson linked formation transition – so smooth and flawless, amazing job! Zimmerman had some of the best control of kicks in Class AA, especially in the beginning. Great use of the floor and formations for a smaller team of 10 girls. Movements were quick and sharp throughout the full dance. Everything was pristine and clean and well thought out, nicely done Thunder! 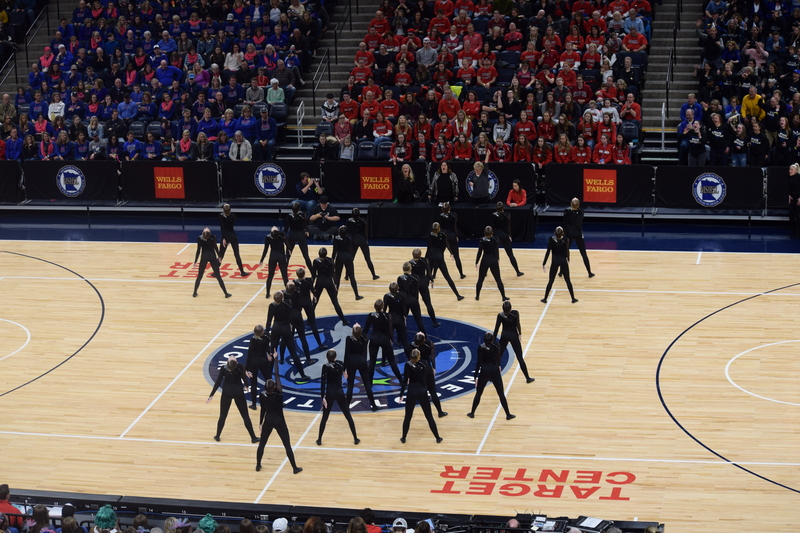 Eastview brought the most musicality to the Class AAA floor! Such intricate movements and foot work that coupled with the accents of the music. The salsa dancing between kick sets was so fun to watch! I was wowed by the transition into the one-line, it was so smooth and perfect. Just amazing Lightning! 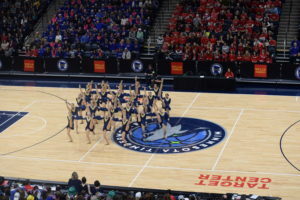 Orono’s brings a great theme and choreography to State yet again! Loved the formations and costuming to tell a full story. Kicks were consistent and well placed. Loved the little nuances from the movie and character solos. These girls danced with a real sense of pride and love for their routine, thanks for the smile Orono! 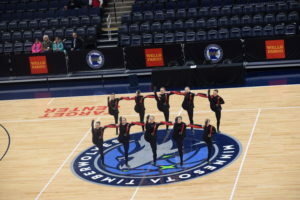 Eden Prairie’s dance was complicated and interesting. The changing of tempos made it much more challenging and difficult to execute. Great control of upper bodies in this dance, especially during the linked transitions! The braids were a gamble, but it helped with the uniformity factor in this dance, well done Eagles! Benilde St. Margaret’s formations were ever changing and elaborate. Very consistent kick in height and stamina. This team really used the full floor and moved from corner to corner throughout their dance! 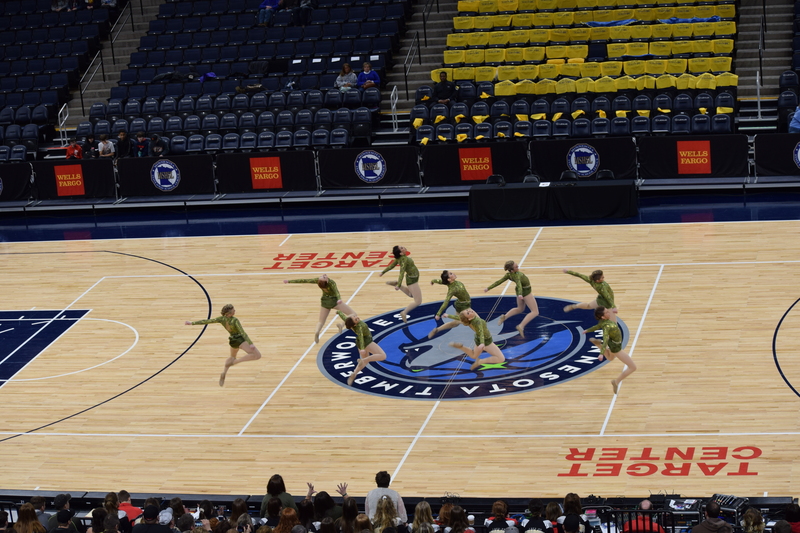 Great kick height and uniformity with each kick set, this team brought some great spice to their theme – great job! Did you see the kicks from St. Cloud Tech?!?! They faced away from me and I was still blown away by their height and sharpness! Their music was fun and upbeat which matched the choreography perfectly. Loved the leap into the roll transition towards the middle of the dance. Great color placement on the leg of the costume too, I am amazed St. Cloud!!! Totino Grace’s dance blew everyone away with their sharpness and incredibly strong kicks! Loved the linked leap and diagonal ripple choreography! So much energy and passion from these girls! Creative and well thought out choreography – really made this theme come to life! LOVED IT E’Gals! 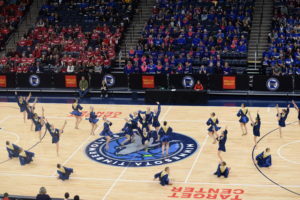 Prior Lake’s dance was well orchestrated. Great transition in lines with the left front leap! Very challenging and stood out for sure – kudos! Great turn set with girls folding into the formation. This team’s dance had strong kicks for sure, but the choreography in between made a bigger impact and helped it stand out! Way to set a high bar Prior Lake! 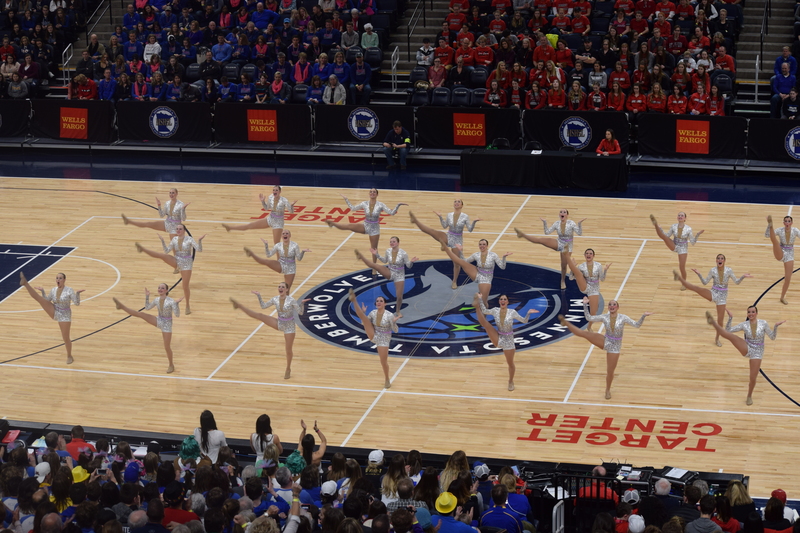 Sartell-St. Stephens stepped up the competition with their kick height and sharpness! Smooth transitions and links, jumps were high and impressive as well. Great kick variety, even when un-linked. Ahh!!!! They had skirts the whole time…WHAT?!?! Where did they come from??? What a fantastic ending, great job Sabre Dance Team! 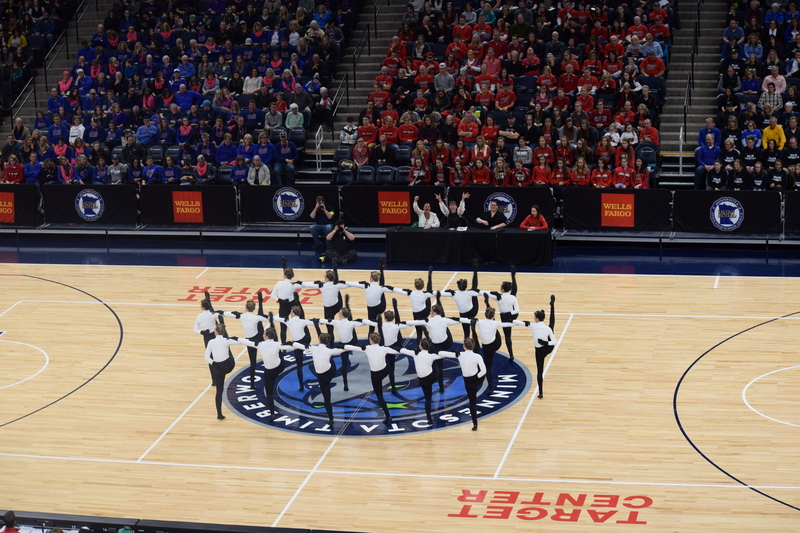 Henry Sibley’s dance was very clean and their tow touches were incredible! Kicks were very technical and accented well with the different leg patterns on the costume. Great lines in formations and a fun song/theme to boot, a great performance from this team! Love it Austin!!!! Great partner choreography that was fun and difficult. Kicks were great quality; high and technically sound. Really loved the formations and transitions and overall execution was terrific. 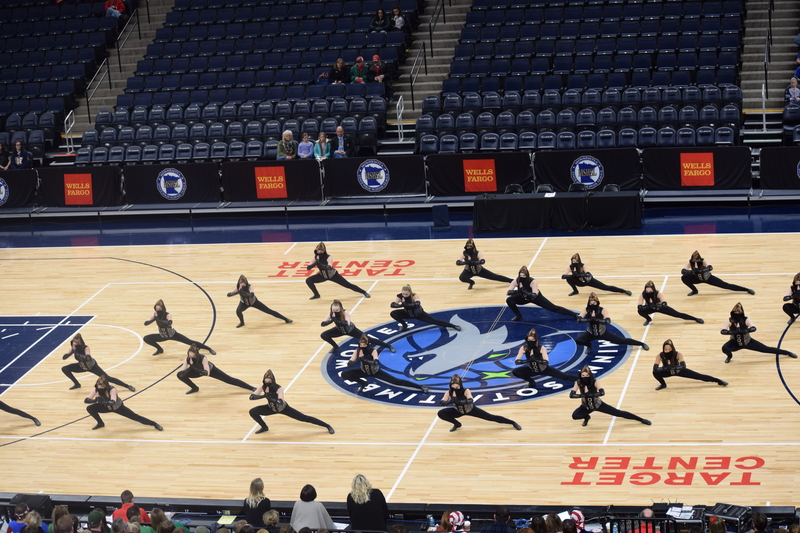 Nice job Packer Dance Team! Chaska brougt very unique transitions and formations to the table in true Chaska form. This team rarely stayed in the same spot for over a count of 8. Intricate arm movements made them stand out and set a high precedent for the rest of Class AAA. Kicks were impressive and well executed; love the one-line choreography! Nice job Chaska! Zumbrota-Mazeppa, Frazee, Wabasha-Kellogg, and Cannon Falls! Aitkin, New Ulm Cathedral, Lac qui Parle Valley Dawson Boyd, and Bagley! Yellow Medicine East, BOLD, Lake City, and Randolph! Cannon Falls closes out the Class A Kick Prelims with a really well thought out Prince dance. Very clean from beginning to end with high and consistent kicks! Kick combinations were interesting and difficult. This team showed exactly what to do when faced with a major challenge after one of them suffered an injury, excellent job Bombers! wow Cannon! way to pull something amazing together in the face of adversity. I would have thought they practiced with that unexpected hole for an injury. It shows what real professionals they are. Wabasha really stepped up their personal skill and execution levels from last season. Solid turning and turning into hookups is no easy feat for anyone, and in class A its quite rare. 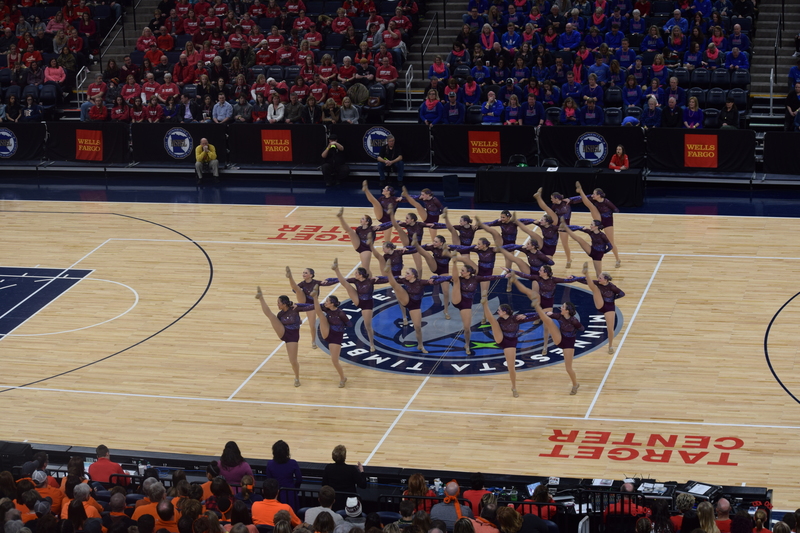 Wabasha-Kellogg’s dance had a lot of great creative arm movements that accented their kicks. Loved the Egyptian theme and music. The turn into the one-line kicks was great!. Kicks were high and sharp, some of the better ones of the division. 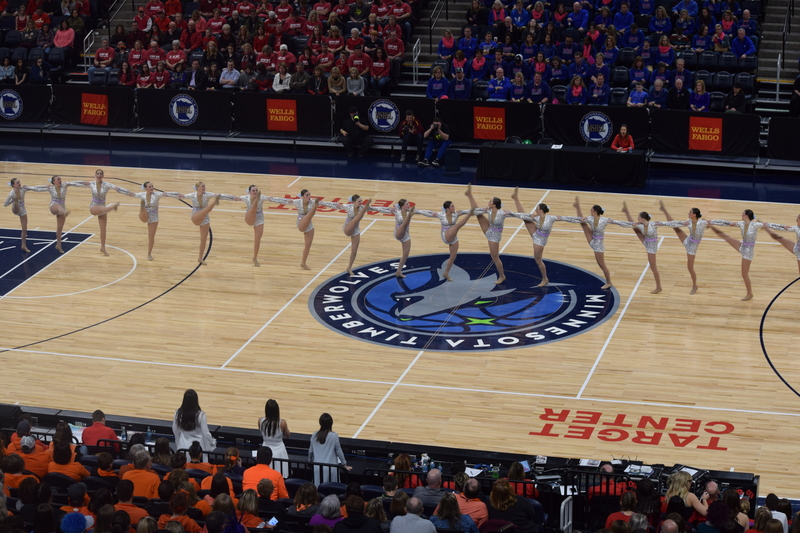 A very well performed routine, watch out for the Wabasha-Kellogg dancers! Cannon Falls will perform at the end of the Class A Division. Let’s go Fly Girls! Their Hamilton dance was so different and well done. I watched in awe until the end now knowing what to think, then at the end I just yelled “YES!” Who knew you could make a kick dance out of Hamilton??? Choreography was an amazing combo of in-sync hip hop with creative formations and amazing kicks to boot! High and well executed kick combinations, absolutely loved it Frazee!!! Frazee’s “hamilton” just takes innovative and dynamic movements to a new level. Musicality, syncopation, attitude and a ton of heart from the Fly Girls. Zumbrota-Mazeppa’s theme was so fun and well orchestrated! Song choices were spot on and fun for everyone! Good use jazz skills in a visually pleasing way. Kicks were very sharp, especially on the left! 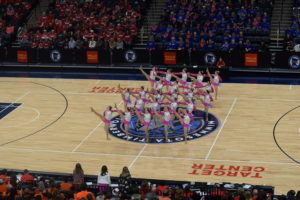 Formations matched the theme and choreography well and made this dance a great package for State. Love it ladies! Bagley easily has the most unique, clever, and engaging theme we’ve seen at state yet. I’m in love with the Beauty and the Beast (mode). Bagley’s theme was so cool and fun! So dynamic and fun with a build from subtle Disney to fun hip hop! Great formations and transitions – very intricate and difficult. These girls were sharp sharp sharp! Kicks were consistent and sharp on the way up and down. I really loved this dance a lot, thank you Bagley! Lac qui Parle Valley Dawson Boyd’s dance caught my eye immediately. The first kick set was stunning and creative. Such a powerful energy from this team, and the transitions were so different and well executed. This was the best technique from a team that I have seen this morning – a dance to beat from the Shadows! New Ulm Cathedral makes a return to the state kick division with “paint it black” – nice to see them return in a division they won back in 2000. New Ulm Cathedral’d dance was sharp and strong for a smaller team. Good use of foot work with kick combinations. Kicks were consistent across the team and well timed. Jumps were a strong point for this team and there was a variety to choose from. Wonderful ladies! Aitkin’s Phantom dance was true to the Aitkin tradition of fun formations and creative costuming. Loved the theatrics and facials from these girls! Kicks were strong and well timed, and the ripple towards the end was strong and very cool and different! Kick height was also impressive and consistent, great job All Stars! Aitkin always fills out themes to the maximum, including a candelabra, pianos, hearts and arrows. Randolph’s routine was the sharpest I have seen today. Great timing in kicks and arm movements, made it very visually pleasing and interesting. The color of their pants was smart as it accented their kick height and consistency. Kicks at the end of the dance were as good as the ones in the beginning, really great job Rockettes! Here comes Lake City! 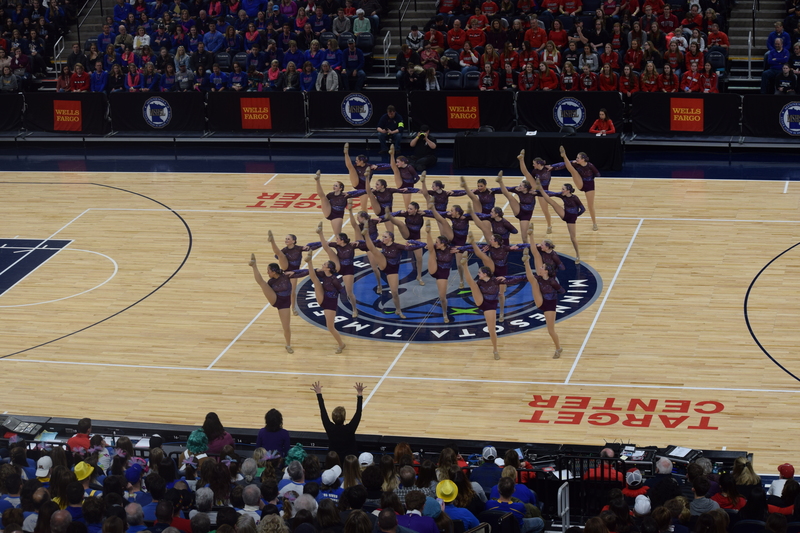 Great unity and timing with their kicks, especially in the second half of the dance. Loved the little odes to the different military branches in both the songs and choreography choices. This team did a lot with a smaller amount of dancers and I loved it, great job! Lake city was ultra sharp. Obviously came to state prepared. BOLD brought us an amazing Ninja dance with fun choreography and use of costumes. The hoods and masks were a great touch to this dance. Fun song choices and ripples that matched the theme. Good variety of kicks and also kick pace – very hard to execute. Way to bring it Warrior Dance Team! Loved the cool ripples and slow stalls with the masks and hoods. It really added to BOLD’s effect. Yellow Medicine Easts starts the day off right with a very technical kick dance. Great kick set towards the end with lots of fans and a visual lines. The music caught everyone’s ear and the choreography coupled nicely with the accents of the songs. Great transitions to boot, especially leading up to the “You are now a Silhouette” line, great job ladies! YME had a great ending with moving triangles into the final finishing pose. The music mix was a true classic! 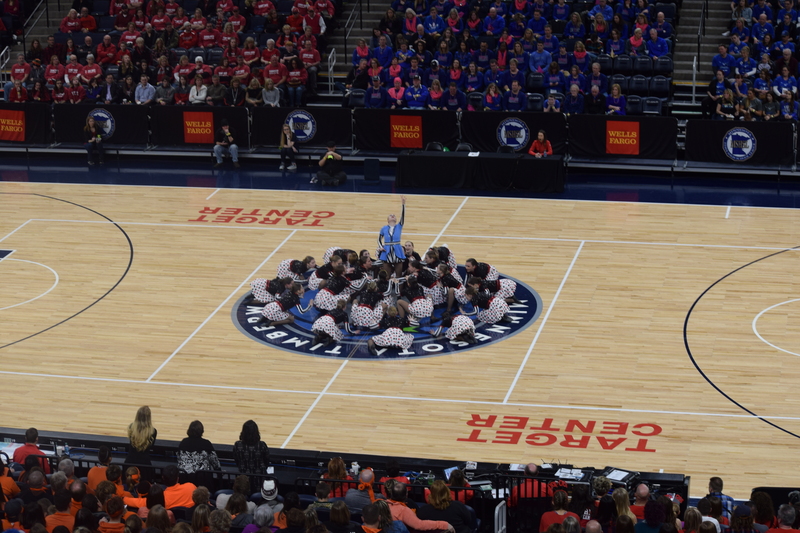 Class A Kick Teams are entering the floor – GET EXCITED!!!!!!!!!!!!!!! In the meantime, let’s recap some Jazz Day standing! That’s it for marking! Doors are opening and the crowd is pouring in! Class A Kick starts at 11:30 with the National Anthem at 11:20, see you then! Thanks for a great Jazz Day! See you tomorrow for Kick! Goodnight! 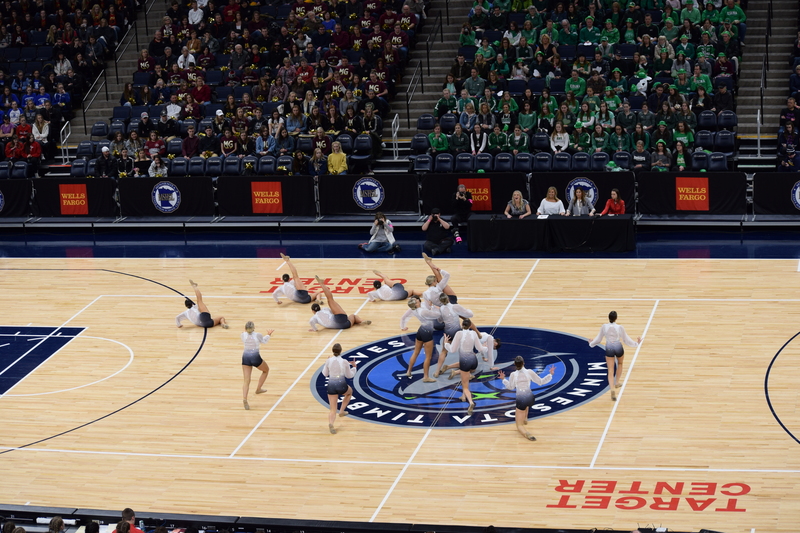 South St. Paul, Prior Lake, Totino Grace, and Edina! Benilde-St. Margaret’s, Lakeville North, St. Cloud Cathedral, and Wayzata! Sartell-St. Stephen, Eastview, Mound Westonka, and Maple Grove! 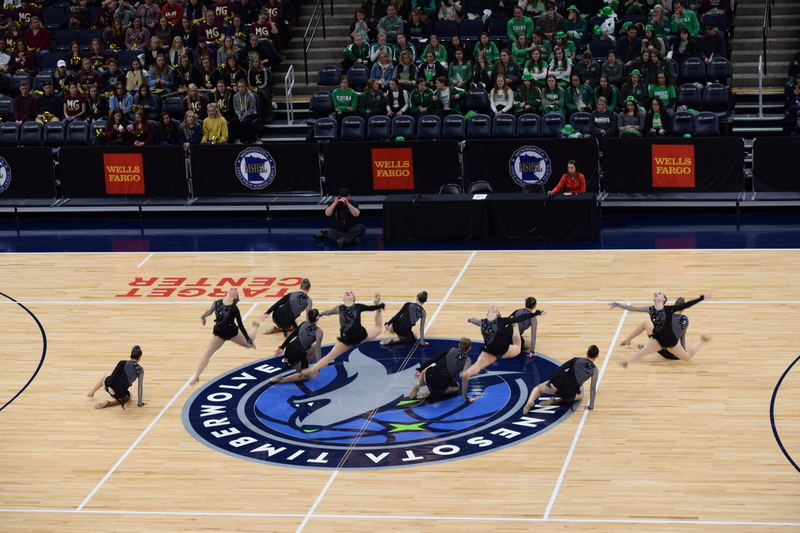 Edina’s dance was the perfect way to end this Jazz competition. The extreme power in the body movements from these girls pierced everyone in the audience. Loved the turn combination towards the beginning with the full team. The complexity of the transitions and formations was unforgettable. I loved this dance, great job! Edina brings us the hopes and dreams with this tear-jerker. Turns were on point for sure. I love how everyone in AAA brings it in finals. No room for error! Totio Grace tells a great story with their jazz dances every yea. The choreography is ever-changing and different than most others, but so unified and performed well which makes them hard to beat. Turn combos were layered and complex, but this team’s floor work really adds to their routine. Awesome job E’Gals! The E’Gals ending sequence is easily my favorite here, including the slow hand grabs at the end. I do love a good show of team unity – it’s a classic. 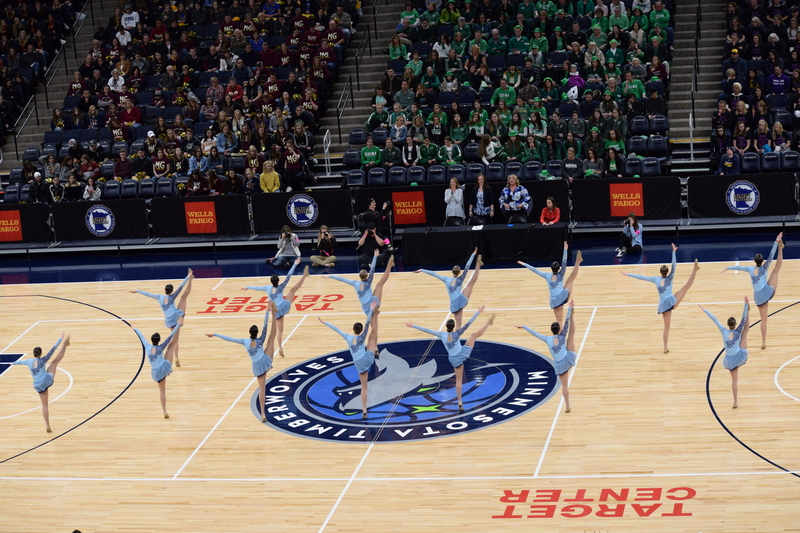 Prior Lake executed their dance with perfection. Skills from these girls are unmistakable, especially in turn set difficulty and technique. Really loved the layered choreography in the middle of the dance in lines, so different and strong. My favorite beginning of this competition I think because of the impact it left on me, amazing! Prior Lake has a great slow headstand by 6 people that I just love. So hard and they always crush it. 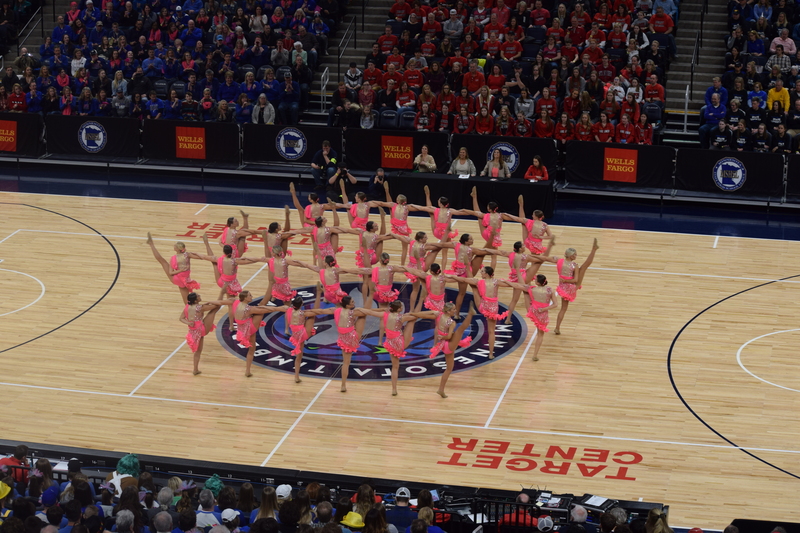 Overall this dance was really powerful and certainly at it’s very best for finals. South St. Paul is excited to be at this Finals competition! Energy from this team slapped me in the face and exuded from each dancer. Turns were timed beautifully. Loved the differentiated leaps and and combined greatly with other extension skills. The choreography between skills though is what kept me interested with this dance and made it stand out from the rest, great job ladies! SSP’s “grown woman” is so catchy and fun. 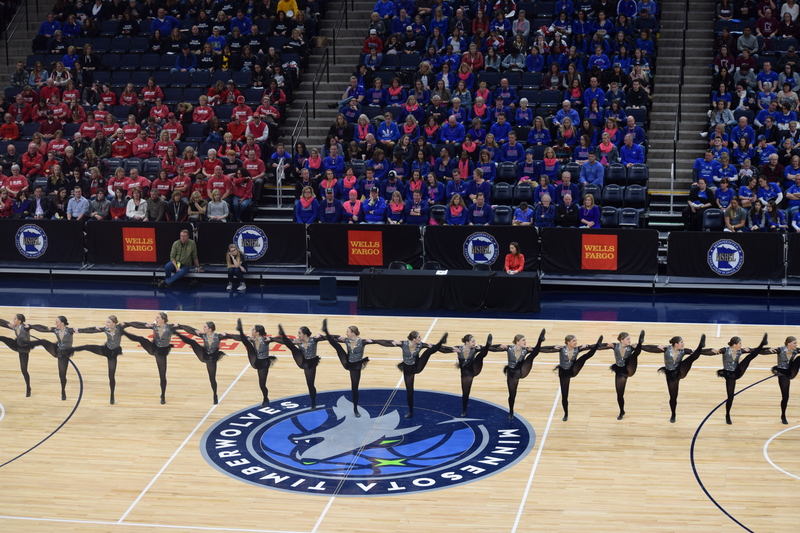 Wayzata’s performance was stunning. Their turn technique is second to none and makes them truly unstoppable. Choreography was smooth but incredibly strong. Loved the staggered entry turn combo near the end with the dynamic jump out of it as a full team with an accent of the music – a trifecta! Superb job Trojets! 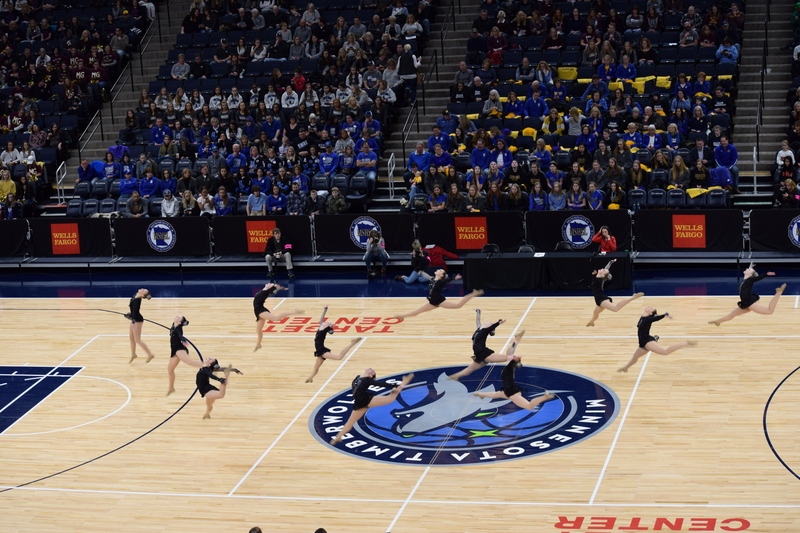 Wayzata was absolute perfection in execution and cleaning. Pretty sure that couldn’t have been done any better. Expect max points that one’s worth. Cathedral has a unique cartwheel/handstand sort of hybrid that stands out as a cool skill of the tournament. I thought they snuck in quite a few unique moments that show why this routine got high enough marks for finals. 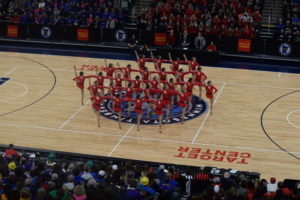 Benilde-St. Margaret’s routine is just beautiful. 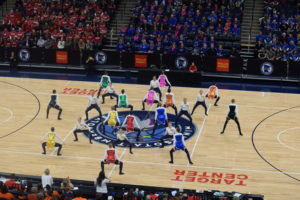 Their costumes shine brightly on the State floor and and they truly moved as one. Turns were executed wonderfully and leap combinations were stunning. Their dance was very stylized and different than expected from this group, which drew my attention and held it from beginning to end! Loved it! 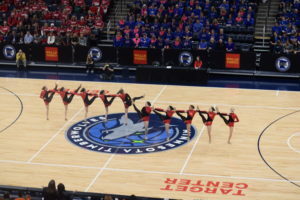 Lakeville North’s dance got even more interesting to me the second time around. I watch more of the non-turning groups and noticed how intricate their choreography was and how difficult the movements really were. I loved when the whole group came together and moved in unison with leveled choreography that really went with the music and made the crowd rise to their feet. Great job ladies! I adore North’s add on turn set. that is so hard to time as the girls starting later have GOT to be on point and at full speed right away. They nailed it. Benilde is so lovely and lifted throughout. It has a nice flowing visual – utilizing smooth transitions to keep us engaged. 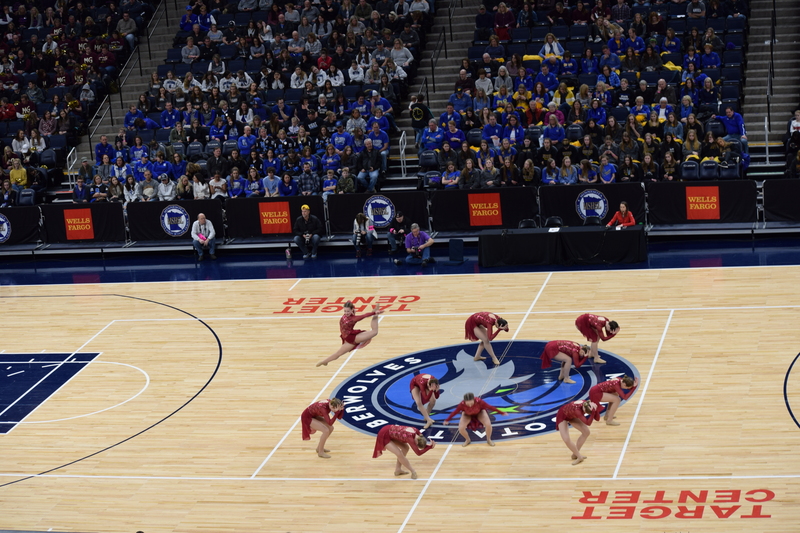 Maple Grove brought their A-game in turns to Finals! Though they looked amazing in Prelims, they will be hard to beat in Finals s they got sharper and their timing went a notch up! Such interesting transitions in the second half of the dance that differentiated them from others as well. A very memorable routine from the Crimson Dance Team! Maple Grove really perfected everything tonight. I noticed more details this time with musical accents and unique choices for landing leaps and turns that defy the expected. 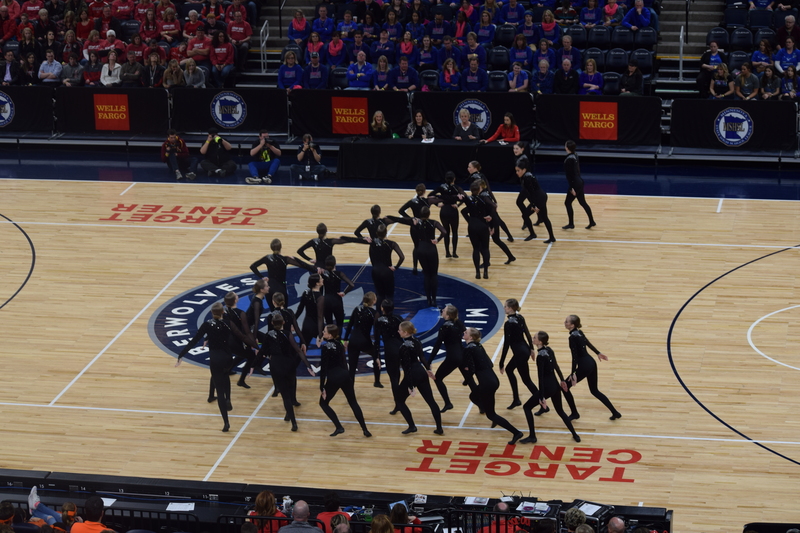 Mound-Westonka’s dance was very dynamic and powerful. Lots of level changes and layered choreography from this team, along with great leaps and jumps! Great formations and transitions, especially with the choreography in the last minute of the dance. 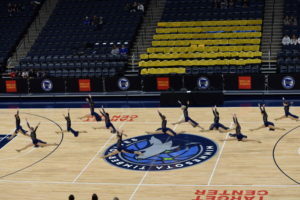 So many great moments with differentiated levels, some girls on the floor extending while others were soaring in the air. Great job! 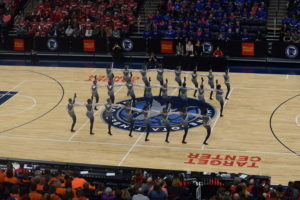 Skyfall is such a great choice for Mound Westonka to depart from their comfort zone and step up the intensity. I’m liking where this one is heading. Eastview ups the passion and really hit their turns tonight in finals. Their dance is so original and moving. Hard to put a value on that. Sheer enjoyment and a feeling of being captivated. 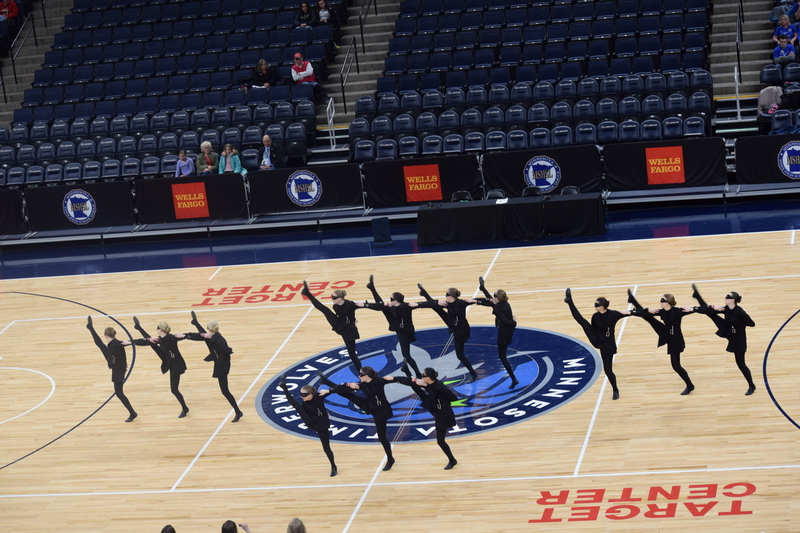 Eastview kicks off Class AAA Jazz Finals with a terrifically performed powerful dance. Their costume choice really adds a lot of visual effectiveness to their routine with their grouping and leveled choreography. Loved when some of the team was turning while others were transitioning around them with beautiful choreography. Turn sets were executed with perfection, loved it Lightning Dance Team! 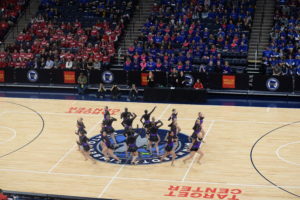 Sartell-St. Stephen starts off Class AA Finals with a sassy upbeat routine. The girls were sharp in prelims, but they somehow are defying basic principles of physics and got even sharper! Lots of great group choreography, especially towards the middle and end. Turn combos were executed beautifully and landings were controlled and precise. Excellent job ladies! Lovin’ the snake visuals and the uniform color creates the full look. Creative holds, lines, and partner-work create the serpent imagery. Congratulations Class A on a great Jazz Day! Class AA/AAA Jazz Finals start at 7:15! See you then! First jazz medal for LqPV! Duluth, Frazee, and Lac qui Parle Valley Dawson Boyd! Lac qui Parle Dawson Boyd’s dance will be hard to forget! The MUSICALITY!!!! Need I say more! Such a variety of upper body movements, arm extensions, and unique combinations! 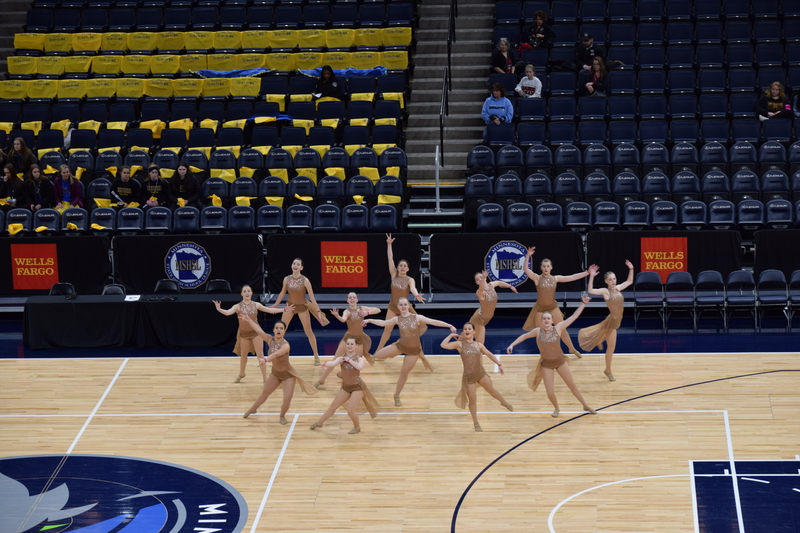 Each turn set was executed perfectly on time and with great technique, this dance was the perfect way to round our Class A Jazz Finals! Way to go Shadows! LqPV really nailed that tough turnset right at the end of the dance it’s a brutal hard place to put that move. Very bold! I love how Frazee uses the “eyes to serve, my hands to learn” phrasing so well in their choreography choices. It’s a mark above what many class A jazz routines tend to contain. 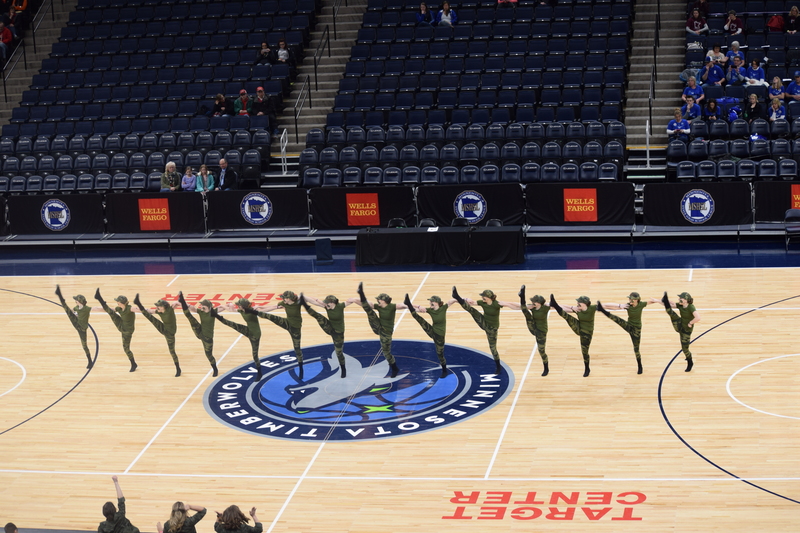 The Frazee Fly Girls control every muscle in their bodies during their routine! Such beautiful movements and arm choreography from these girls. The expression in the girls’ faces and body language is truly amazing. Turns placement was precise and executed perfectly, a very remarkable dance! Wow, Duluth Marshall brought a stronger and cleaner routine to Finals! Love the heart in this dance. Great jumps from these girls and movements that matched up with the music perfectly. The smiles from these girls radiated up to our booth, so wonderful to feel from them:) Turn combinations were slow and difficult! Nice job ladies! Duluth Marshall stepping it up in finals with a much sharper performance and a confidence that comes with being here on a regular basis. YME brings us an ocean of emotion with “never let me go”. They sure do bring the passion when it’s finals time. Who are we? YME!!! 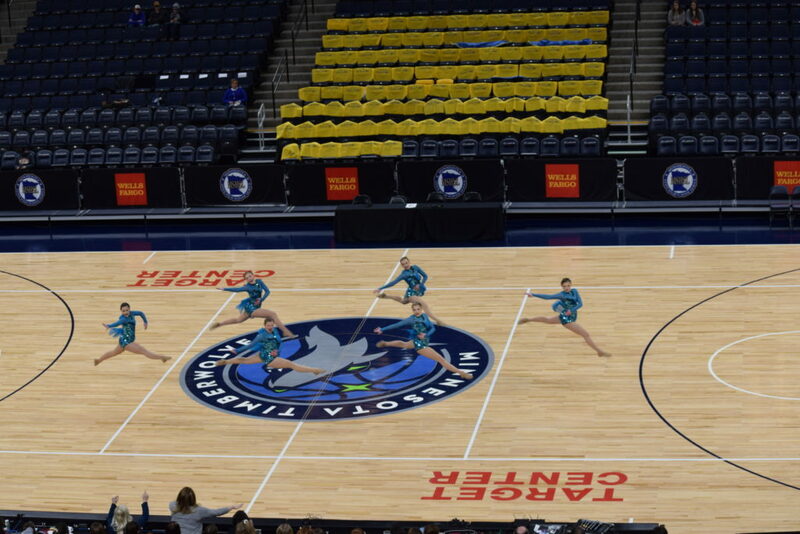 This 6 girls take over the entire State floor, impressive! Still love the little solo tricks throughout this routine, helps it stick out from the others. Good jump height and turn technique from this group, and I have to give a lot of love for the costumes! Great job YME! 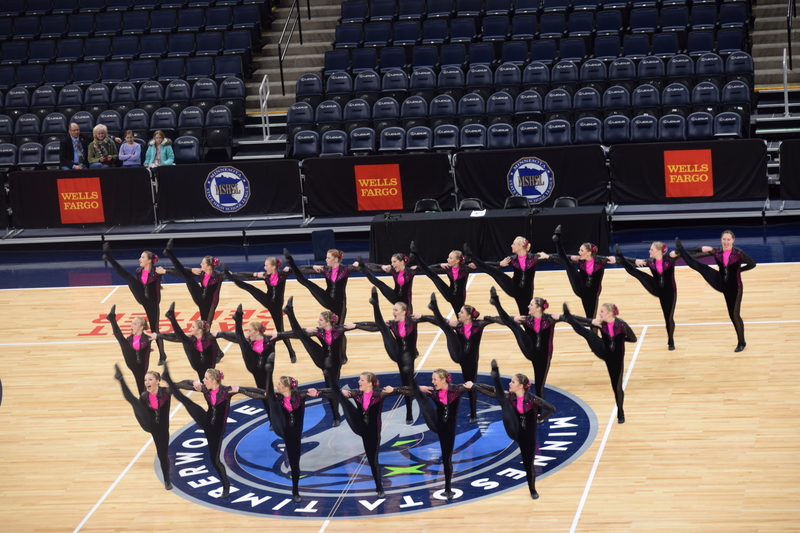 Aitkin – way to bring it with the jump combinations! A very great use of skills in this dance! Turn combinations were strongly executed and each was unique from the rest which was fun to watch, but difficult to perform. Really liked the precision of each movement and how controlled everything was, great job Aitkin! 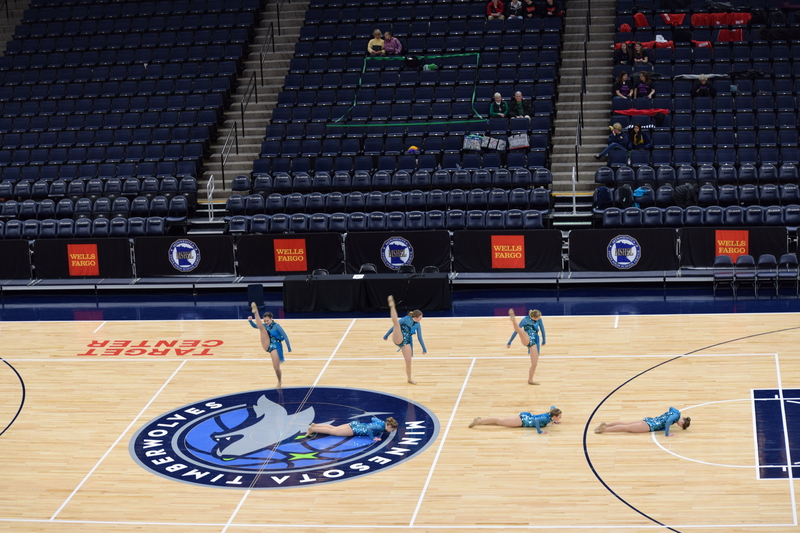 Aitkin has a really interesting floorwork section that I think sets them apart in the jazz field this year. They took some risks this season and it’s paying off in the end. Get ready for Class A Jazz Finals! Starting in a few minutes with the National Anthem! Maple Grove, Chisago Lakes, Brainerd, and Waconia! 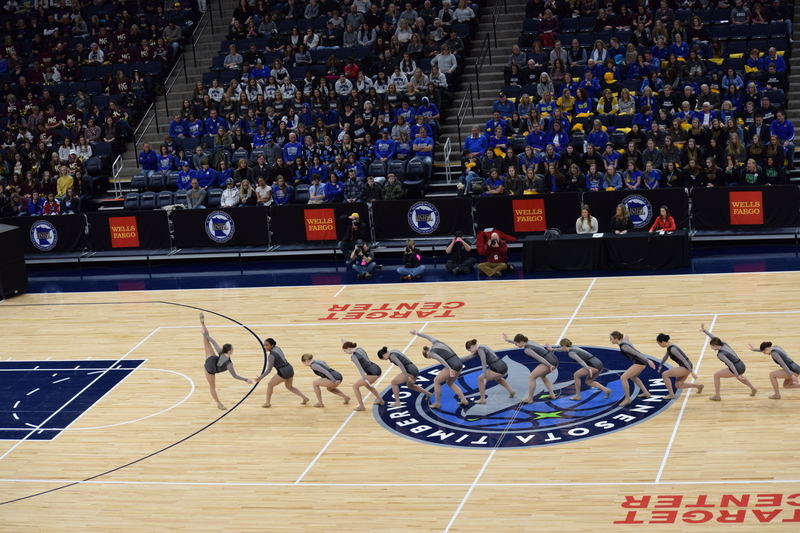 Totino Grace, Prior Lake, South St. Paul, and Spring Lake Park! 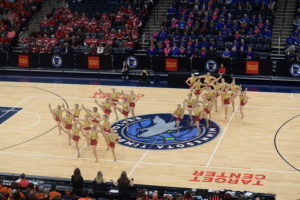 Wayzata, Eastview, Marshall, and Lakeville North! Rocori, Anoka, St. Cloud Cathedral, and Benilde-St. Margaret’s! Sartell-St. Stephen, Edina, Simley, and Centennial! Mound Westonka, Blaine, Faribault, and Moundsview! 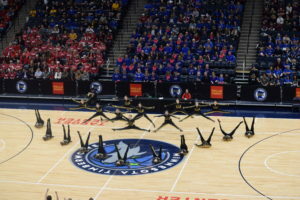 Totino Grace’s dance was truly a story in itself:) So unique in its movements and transitions. Also, you cant miss their amazing technique in their leaps and turns. Turn sets were well executed and difficult. And the costumes; so sparkly and beautiful! This dance will be hard to forget, great job E’Gals! Prior Lake’s dance was strong and precise. Great turn sets and technique! The ending was so captivating! The team moved as one in everything, great transitions and creative level changes. Loved the difficulty in turn combinations – a true strength for this team. 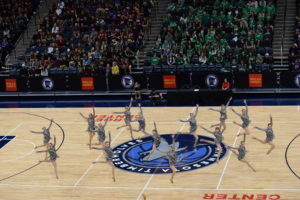 Great job Prior Lake! 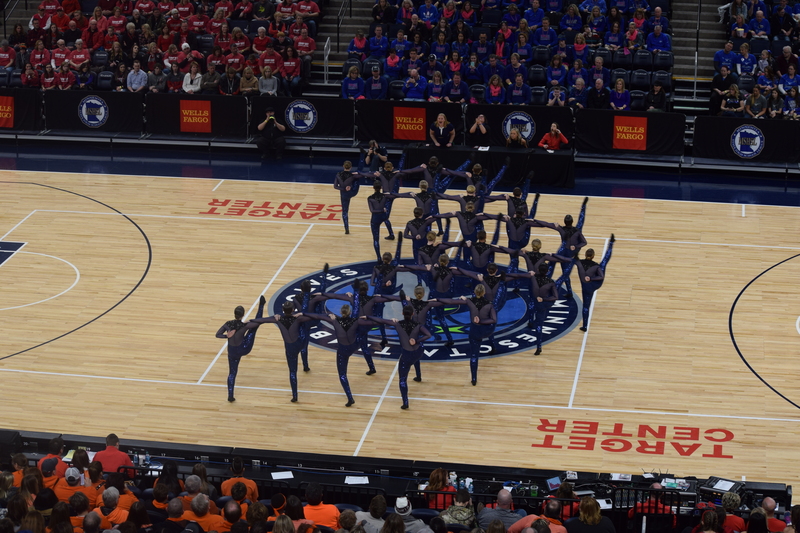 South St. Paul brought us a peppy, fun dance to round out Class AA Jazz. So much energy and bright facials from these girls! Great leaps from this team and the combinations around them are superb! 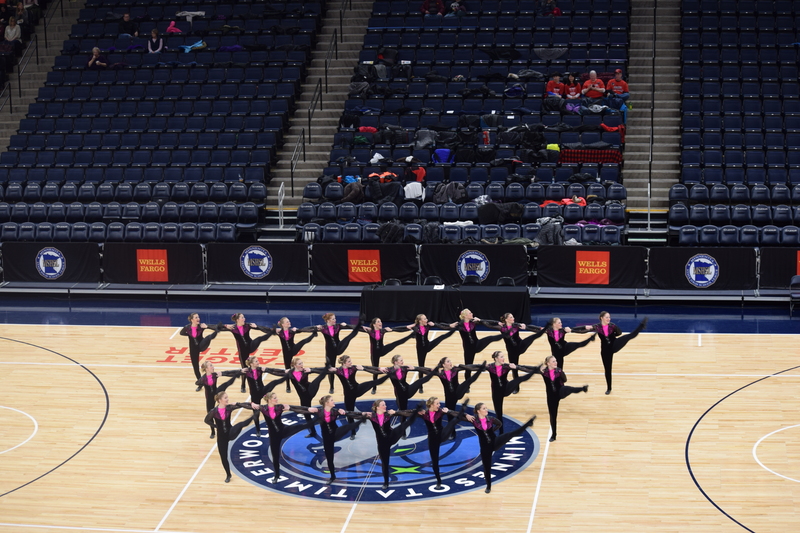 This dance didn’t slow down and kept those girls moving until the very end, awesome job South St. Paul! Spring Lake Park rounds out Class AAA Jazz Prelims with beautiful costumes that accented their turn combinations making them stronger and more unified! Later using their skirts in their choreography – so fun! Great use of the floor and formations were versatile and unique. Great way to end our Jazz prelims ladies! I’m loving the South St. Paul style year after year. “Grown Woman” doesn’t disappoint for sass. 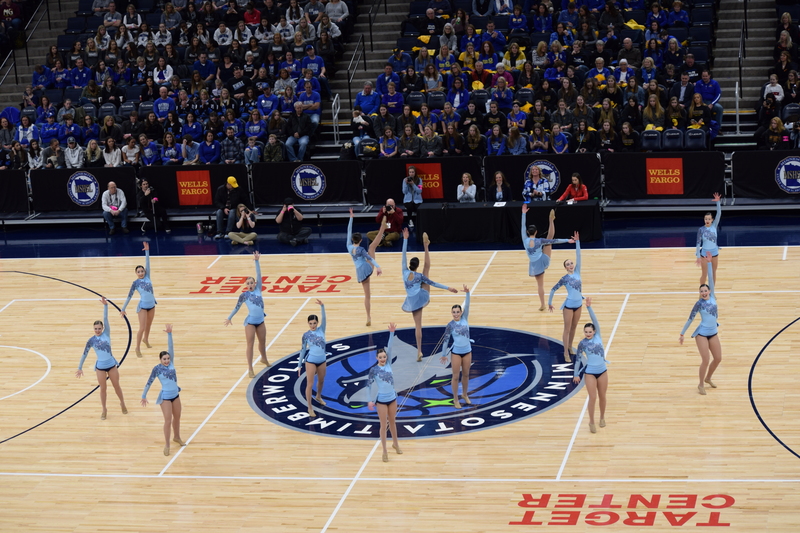 Eastview brought a great routine that exemplified a message of love and power to the whole Target Center. Great group choreography and visual movements and transitions. I am blown away at how this dance made me feel! Amazing turns and technique in…just everything. Just wonderful Lightning Dance Team. Marshall’s dance was very clean and precise! Great transitional movements and arms! Loved the part with the solo in the middle with the fun partner work surrounding her. Super sharp arms and leg movements, made the dance very visually pleasing and intricate. Great execution ladies! 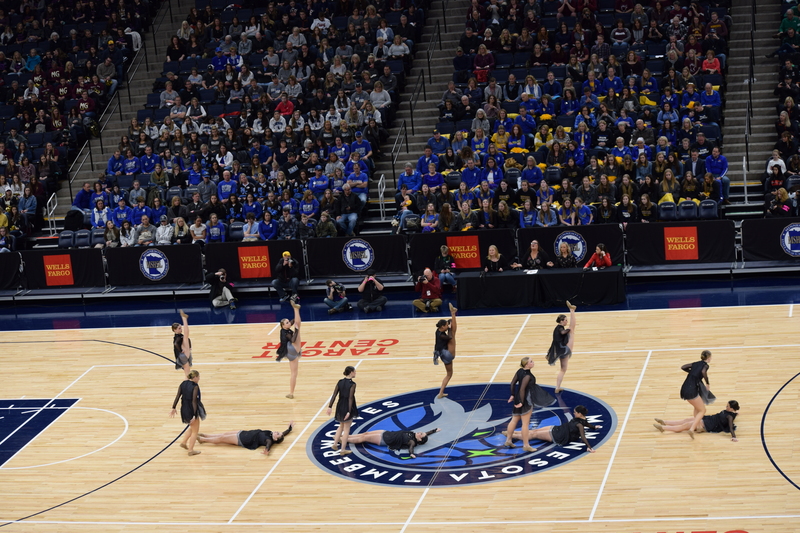 Lakeville North’s dance sent chills down my spine:) Especially the choreography towards the end – surprise levels and extensions paired perfectly with dynamic music! Turn sets were unified and performed with great technique. Plus, you can’t go wrong with a little Journey at the State Tournament! Love it! 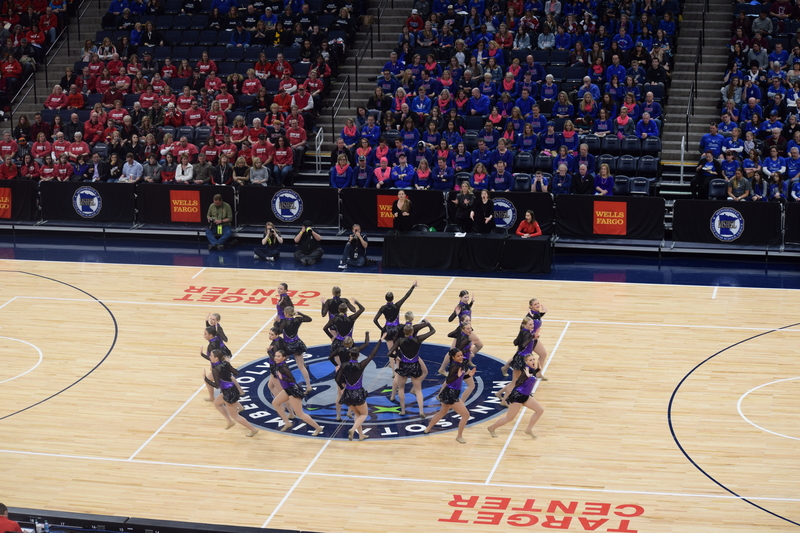 Waconia made a strong song choice with a slower beginning that builds with their dance and choreography! Great extensions from these girls and strong technique in placed choreography! Overall – a strong performance with a variety of skill level and stamina. 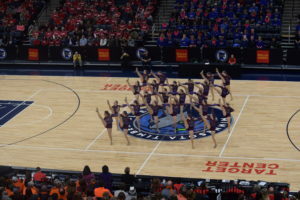 Awesome job Waconia! 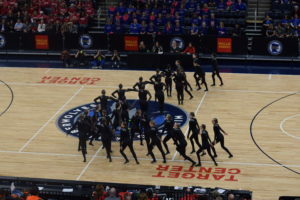 Maple Grove dance was full of creative movements and technique. Turn sets stood out as they displayed skills that other teams lacked. Great use of music and movement towards the end – really captivated the audience and myself! Great extensions and leg placement in jumps and leaps – amazing job Crimson! Great job Chisago! Movements complimented the music so well and choreography was creative and strong! Body placement was difficult and really displayed the skill level of this team. Transitional choreography was super impressive and well executed – it really drew in the crowd and left us all in suspense. Wonderful job Chisago! 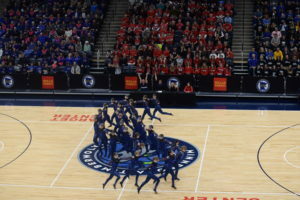 Brainerd’s dance was full of strong movements and choreographed transitions that were quick and strong while the music stayed smooth – very interesting!! Great use of the floor and formations! Such interesting shapes and transitions! This team does well with extensions and holds. Nice job Kixters! 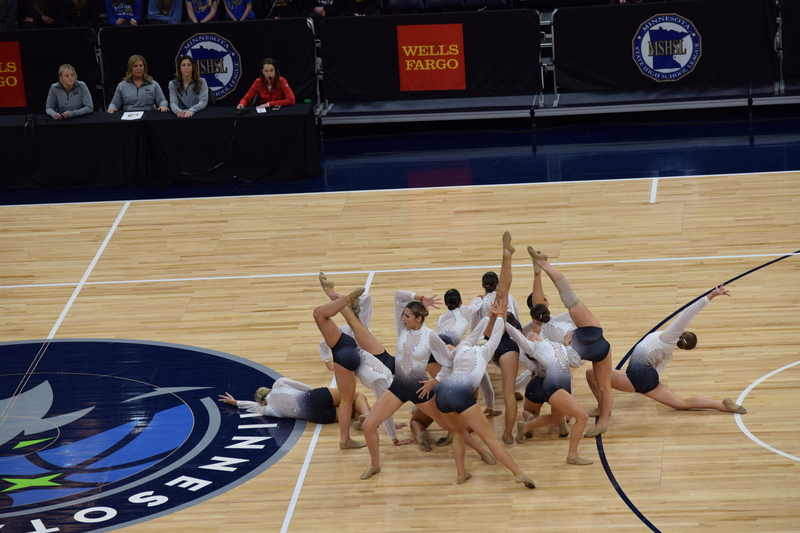 Wayzata brought their A-game with amazing control and stamina from each girl. Choreography complimented the music perfectly with strong movements and transitions. Great turn sets that were perfectly placed and controlled. Great performance Trojets! Benilde-St. Margaret’s dance was beautiful and breath taking! Their beginning left me so captivated and I couldn’t look away! Every part of their body was engaged and dynamic! I felt energy on leaps, turns, transitions, and simple head movements. So impressive, wonderful performance ladies! Rocori’s dance was full of surprises! I felt that most of the jumps came out of nowhere and were high and clean – very nice! Great facials and energy from these girls! This dance made me smile from ear to ear – great stamina and control Rockettes! 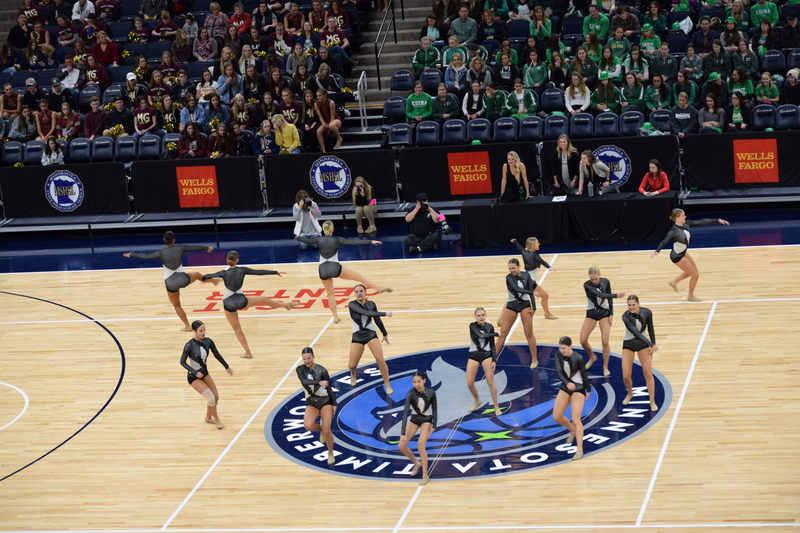 Anoka gave us a lot of group/partner choreography that really made it stand out! Great whole-team pirouettes and turn sets, strong with good technique. Very visual and well thought-out choreography, so much variety of movements. Nice job ladies! 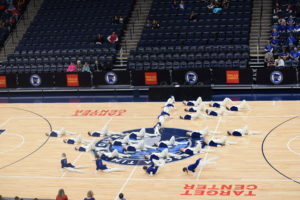 St. Could Cathedral’s dance had amazing formations and transitions! The middle section was like a kalidescope with levels and floor-work choreography! Very cool jumps and leaps from this team, coupled with strong multi-level choreography made this team a strong competitor. Great job! Loved the beginning of Simley’s dance – used the full floor and left me guessing what would happen with every count. Great extensions from this team – a main strong point. Leaps and jumps were well executed with beautiful lines in their arms and legs. Terrific ladies! Centennial – LOVED these costumes! They gave this dance a very visual dynamic that added a lot to this choreography. This dance had a lot of energy and large-group movement that was beautiful and crowd pleasing. Very fluid transitions and expressive arm movements, very pretty ladies! Sartell-St. Stephen combined amazing technique and fun hip-hopish choreography throughout the dance. Formations were impressive and ever-moving. Loved the groupings towards the end with the extension holds and other skills – super interesting and fun to watch. Way to go Sabre Dance Team! 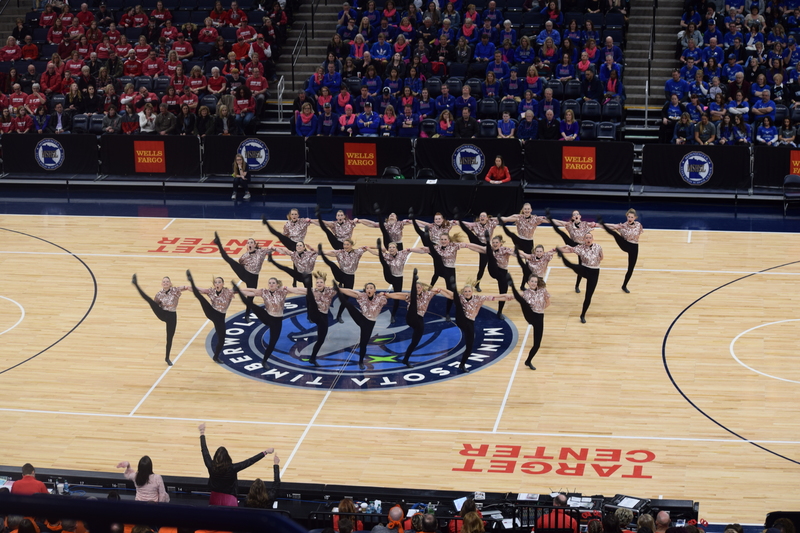 Edina – did you just do 10 pirouettes (or more) in a row?!?! What a game changer of a dance! So strong in every movement; I don’t even think this dance had counts but each dancer was in sync with every other dancer! 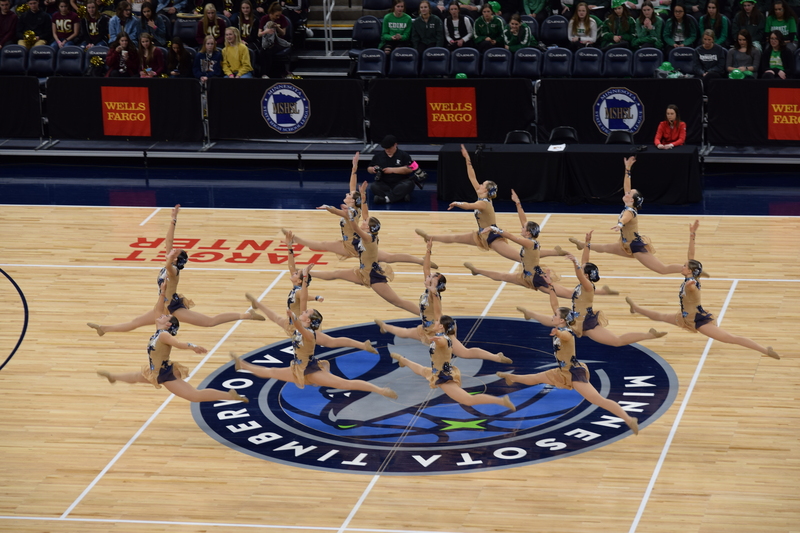 I am blown away Edina Dance Team, hope to see this amazing routine at Finals! Class AA/AAA Jazz Prelims starts at 2:00, see you in 15 minutes!!! Houston, Richfield, Aitkin, St. Charles, PACT, and Duluth Marshall! Lac qui Parle Valley Dawson Boyd! PACT had a good variety of combinations and skills. Loved the use of levels and jumps, very clean and pretty to watch. The colors of the costume were beautiful and fit the dance well. Jumps and leaps were this team’s strong suit and each set was executed beautifully. 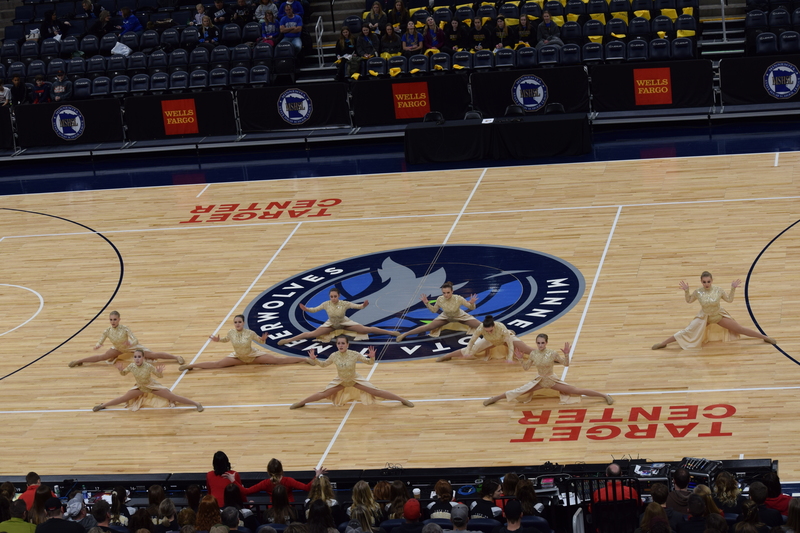 A strong wrap up to the Class A Jazz Prelims, thanks Pantherettes! St. Charles and PACT wrapped up the meet with some of the cleanest and sharpest routines of the day. St. Charles blew me away with their strength and power! At first the beginning of the dance stood out to me, but at the end I realized that I had taken pictures until the very end because I was so captivated! This team displayed great precision and control in everything from turn sets to transitions. Way to bring it ladies!!! 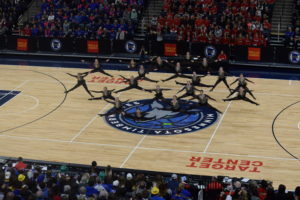 Aitkin’s dance was dynamic and very different from other Class A dances. Choreography stood out and matched the song choice beautifully. Technique was strong and floor work was intricate. Nice control of extensions on all levels, liked the choreographed transitions with layering and different skill levels. Nice job All Stars! Hello Richfield! Great song choice and upbeat choreography! Pony tails were a good choice as they brought some great sass to the dance! The energy and facials were strong, even during leaps and turns. The dance had a lot of levels and formation changes, even with only 6 girls! Nice job ladies!!! Loving the upbeat music choice in “Fire” from Richfield. Some interesting turn choices including one that rotates right, then unwraps to the left that stood out. 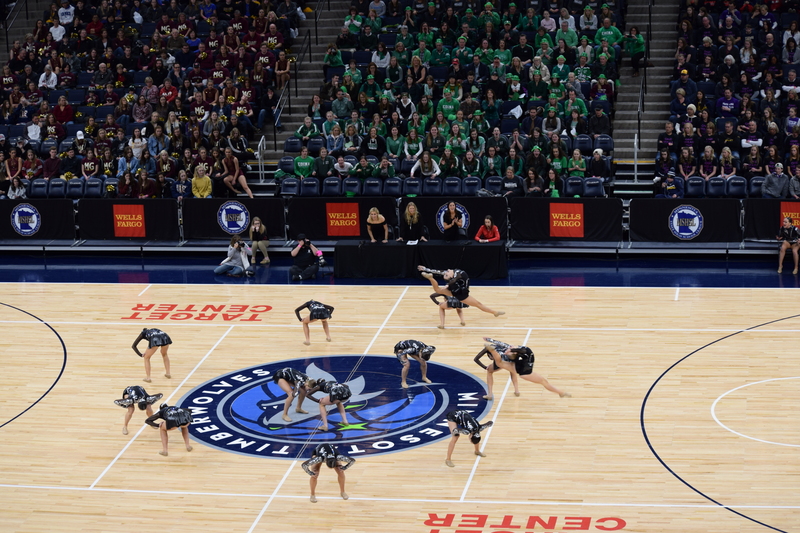 Up next, Richfield – the first dance team to ever win a state championship is back at state after many decades! 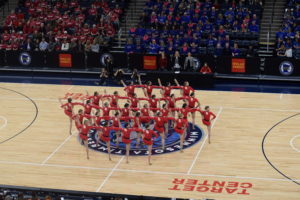 The Houston Dance Team displayed a lot of group work and choreography which was fun to watch. Very pretty unified jumps and extensions. Loved when the team broke up into three different parts and displayed the different skills – still in lines but the choreography was layered and interesting. Great job ladies, glad to see you here at State! I love it when a tiny town has a huge showing at state like Houston does! Duluth Marshall’s dance was very cute and happy, I bounced along the whole time smiling:) Each dancer had beautiful jumps and extensions in the air. Facial expressions were strong and never faded, and movements stayed strong until the very end. 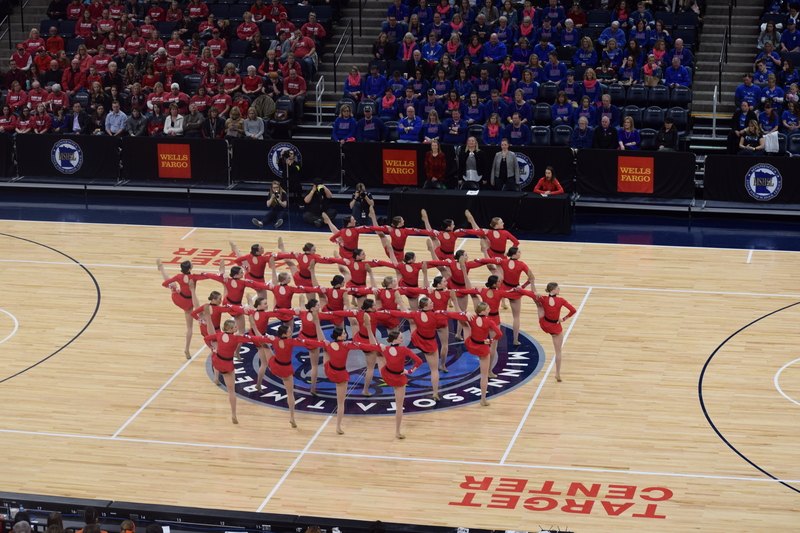 Really enjoyed the classic feel of this dance and song, wonderful job ladies! Great use of lyrics to drive the choreography Fly-Girls. Such pleasing technique makes this one easy on the eyes. Frazee brought beautiful turn combinations and skill. I smiled through each combination and loves that each was different from the other. Choreography was sharp, yet soft. Strong cores in each of these Fly Girls! Great use of music and dynamics in simple arm and leg movements, excellent! Lac qui Parle Valley Dawson Boyd – such a fun dance!! This dance left me wanting more and hoping to see it again. Such interesting choreography to go with the song, never knew what was coming next which was incredibly captivating. Also loved the pause towards the end in the bridge that made the crowd truly gasp. Amazing job Shadows! I always thought ‘Believer’ was a great Class A jazz song choice…..
New Ulm Cathedral – loved the high releves from each dancer during turn combinations:) Costume choice showed off their strong arm placement and made the dance very visually pleasing. Nice control throughout the dance and HIGH JUMPS! Terrific work! NUC had some of the highest jumps we’ve seen yet today. This is a growing program on the rise every time I’ve seen them in the last few years. Solid jazz debut. Wow ZM — that was really strong and easily the most complete package routine in recent memory from your team. Easy to see why they’re section champs! Love the costume choice from Zumbrota! Great use of formations and transitions – they never stayed in the same spot for more than a count of eight! Turn combinations compliment the music well and really enhances this dance visually. 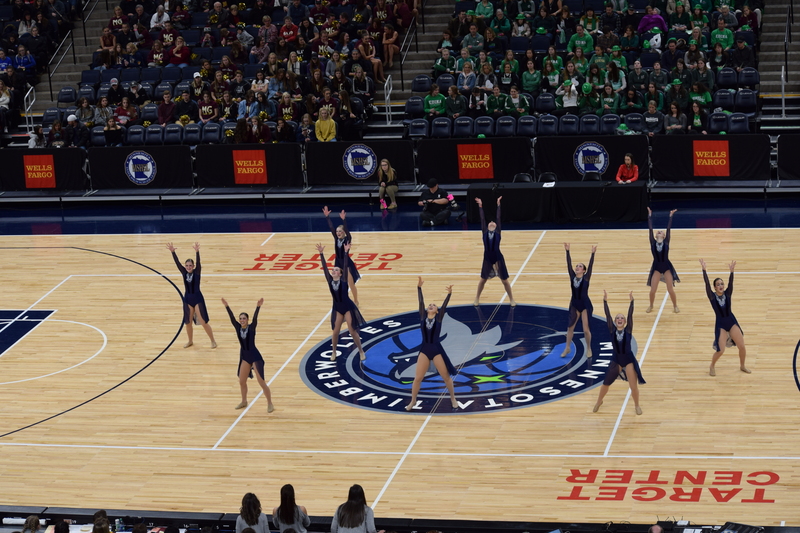 A strong performance from Zumbrota-Mazeppa, loved it! Some great athletic skills YME. Difficulty was off the charts. Great synergy from the YME Silhouettes! Turn combinations were impressive and unified, great technique from each dancers. The choreography was sprinkled with fun and interesting solo-ed moments as well displaying great extensions and abilities from different dancers which was fun. Nice job YME! Class A Jazz Team are about to hit the floor! See you after the National Anthem! Karen and I are so excited you’re joining us for another state tournament coverage day!! Doors just opened up!!!!! Come grab a seat and get ready for the magic!!! Woohoo Jazz Day!! !